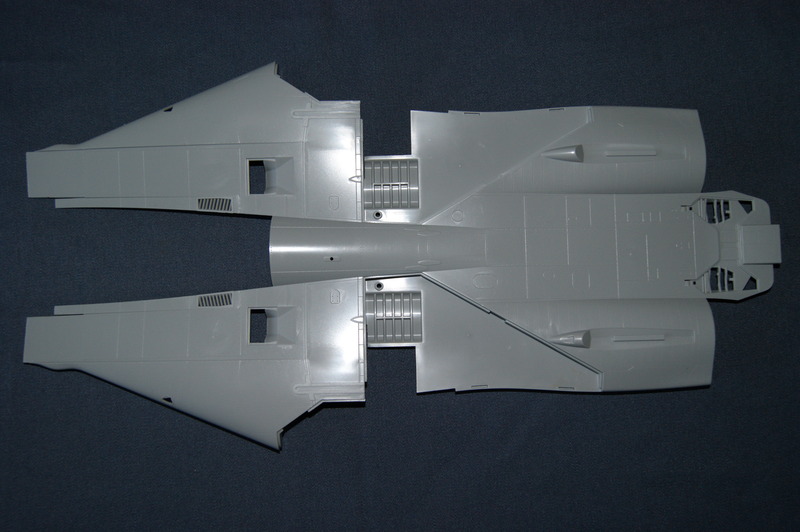 The F-14 Tomcat is a variable sweep wing fighter aircraft which came as a replacement for the F-4 Phantom during the nineteen seventies. 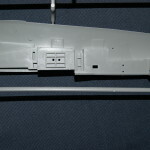 Three main versions of the Tomcat were built, the ‘A’,’ B’ and ‘D’. 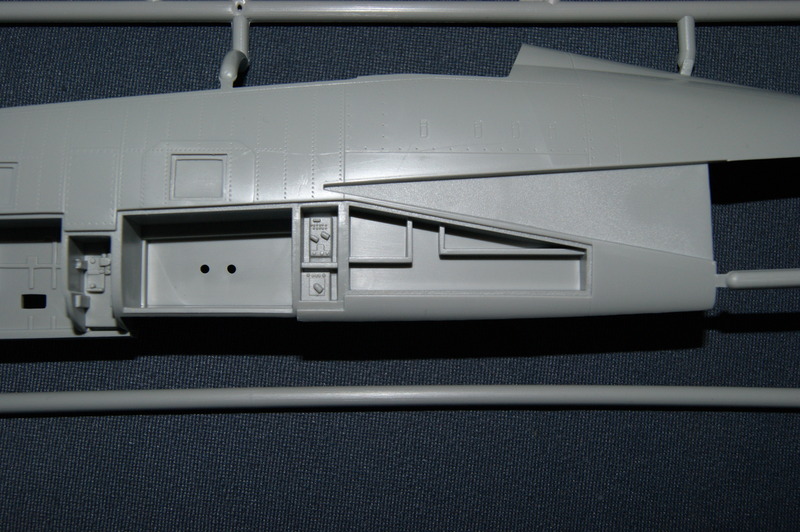 The ‘D’ had upgraded engines just like the ‘B’ but had better avionics, radar and more. 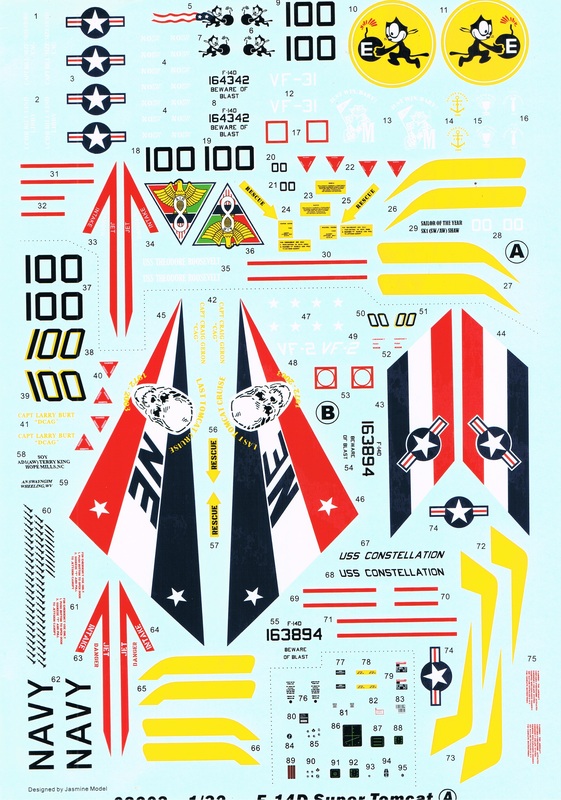 The movie ‘Top Gun’ did a lot for this aircraft because every time I mention this aircraft people almost always refer to this movie. 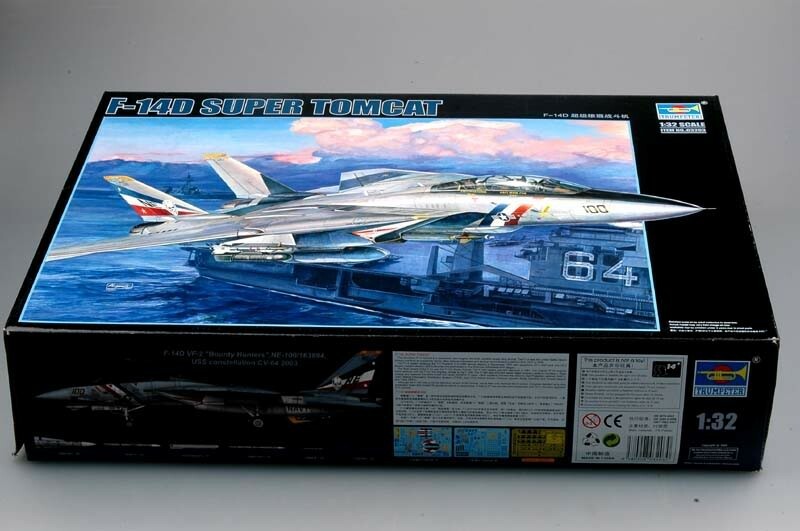 Sadly for the Tomcat fans it retired from naval duty as the F-18 Hornet took it’s place in 2006. 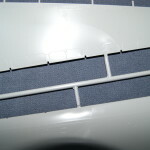 Let’s talk about the kit. 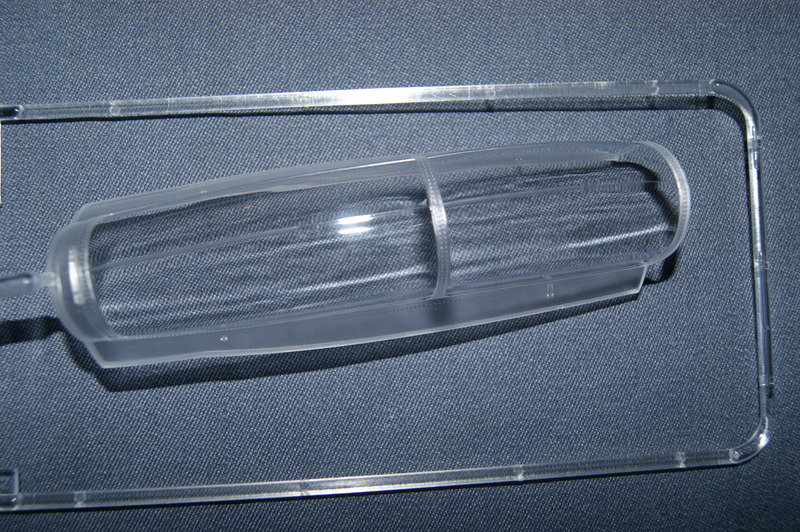 It comes in a big sturdy box with a flip cover and even has a handle for ease of carrying. 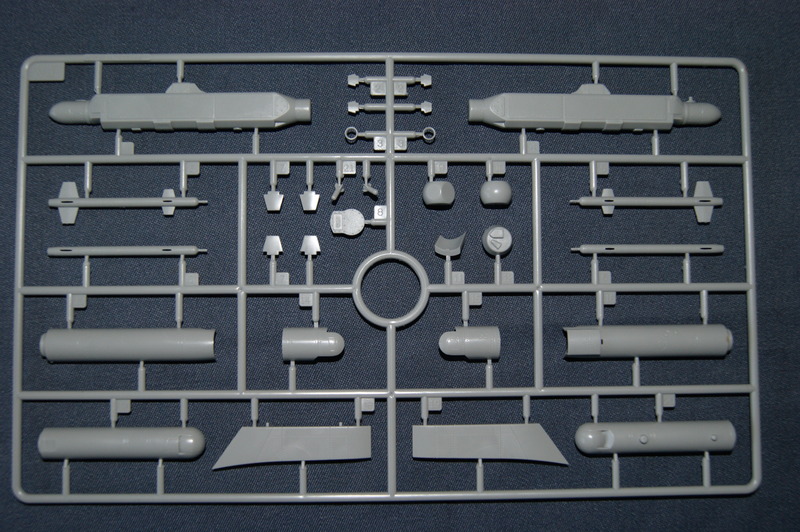 When you finally open the box you’re greeted by a whole lot of plastic! 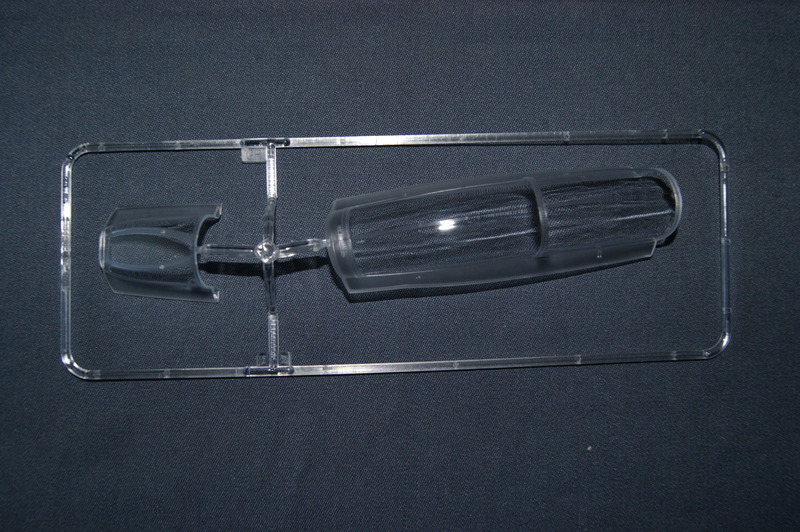 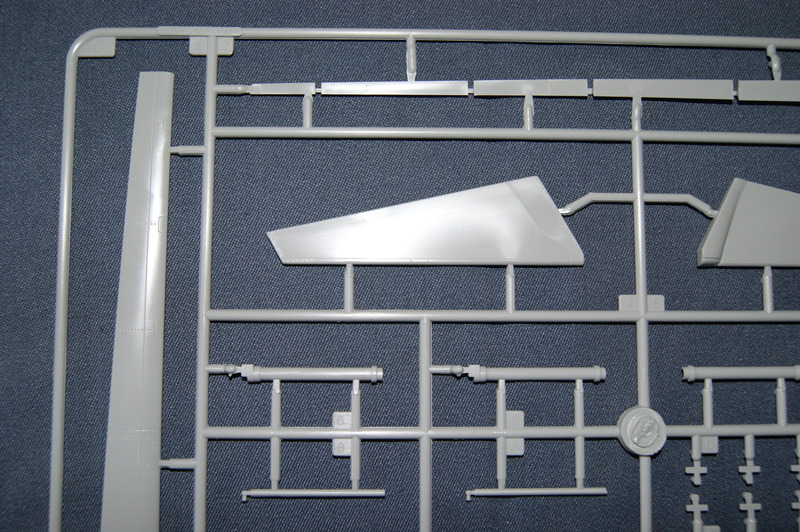 The big fuselage parts in its own plastic holder immediately catches your eyes. 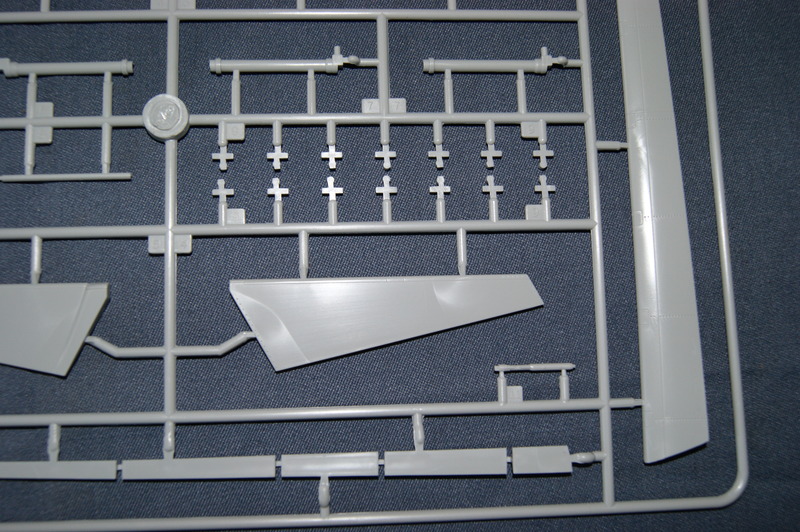 The amount of plastic in this kit is staggering! 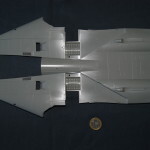 Of course that was to be expected with such a big scaled aircraft but still you probably would be amazed too. 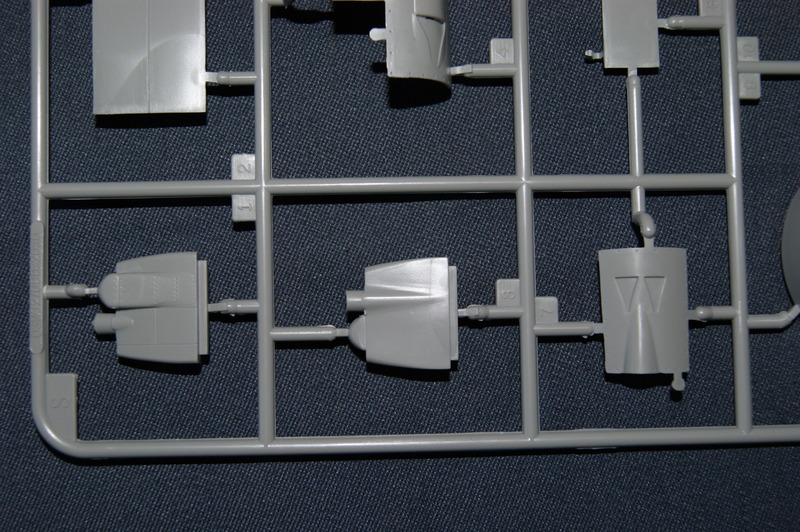 Now let’s talk about what is in the box exactly. 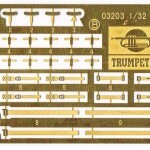 Instruction sheet: The typical Trumpeter booklet with the black and white systematical instructions. 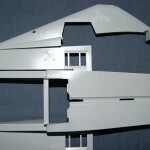 Which could perhaps be a bit too much if you are a novice builder. 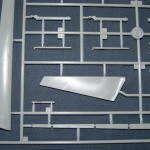 Upper fuselage: Packed in a plastic box along with the lower fuselage comes this biggest part of the entire kit, the upper fuselage. 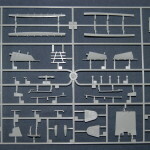 It has gorgeous detailing and when you hold it in your hands it gives you a little sense of the sheer size of this kit. 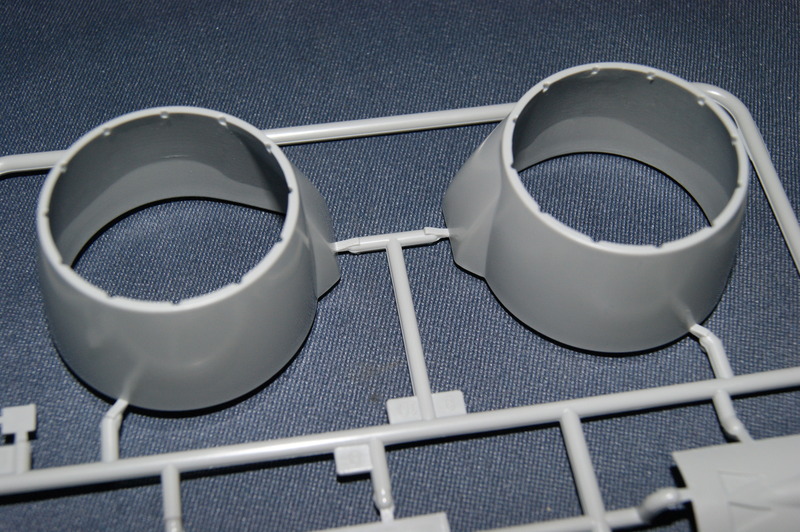 Apart from three little points that need sanding away it absolutely looks great. 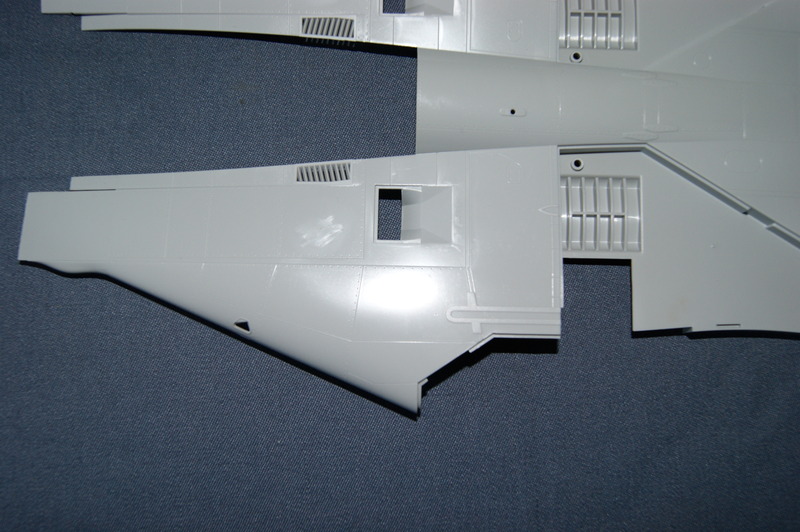 Lower fuselage: Like the upper fuselage, a few points that need sanding away. 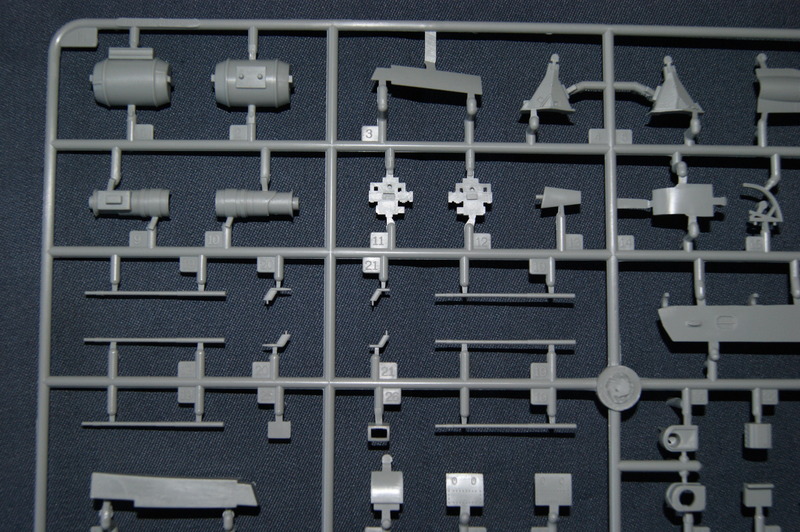 I don’t exactly know what these are but my guess is that these are cutting points for molding or ejecting, otherwise it looks absolutely terrific! 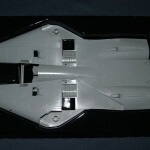 The detailing is nice and crisp, you almost can see yourself fitting in the engines and intakes! 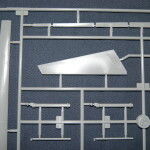 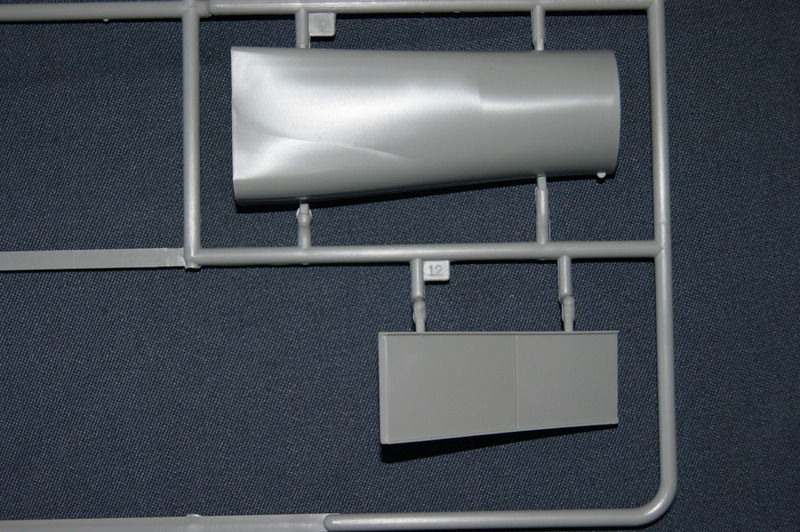 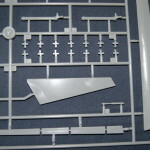 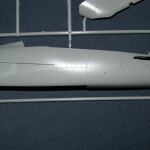 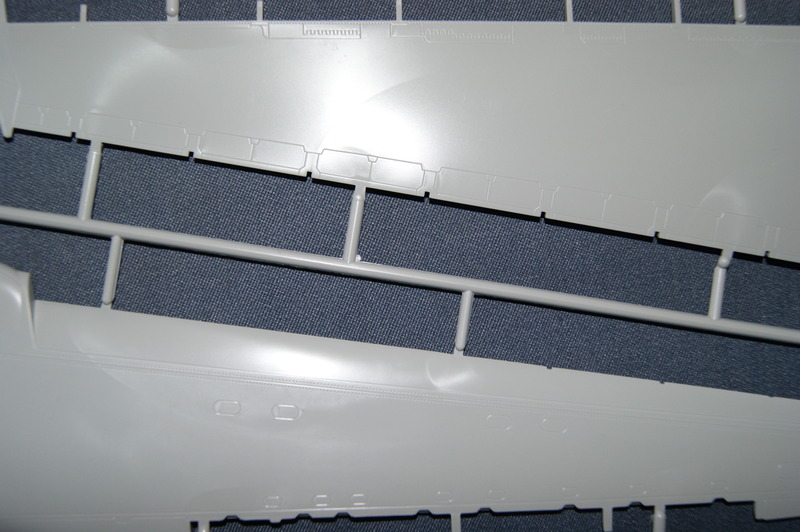 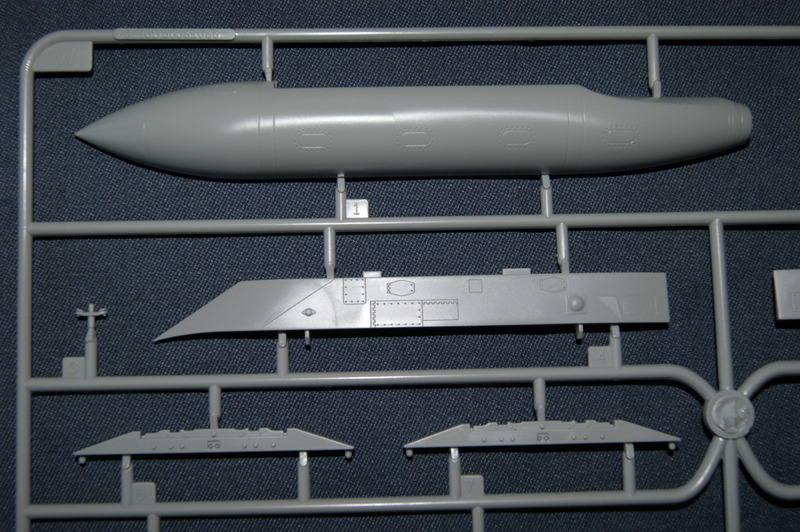 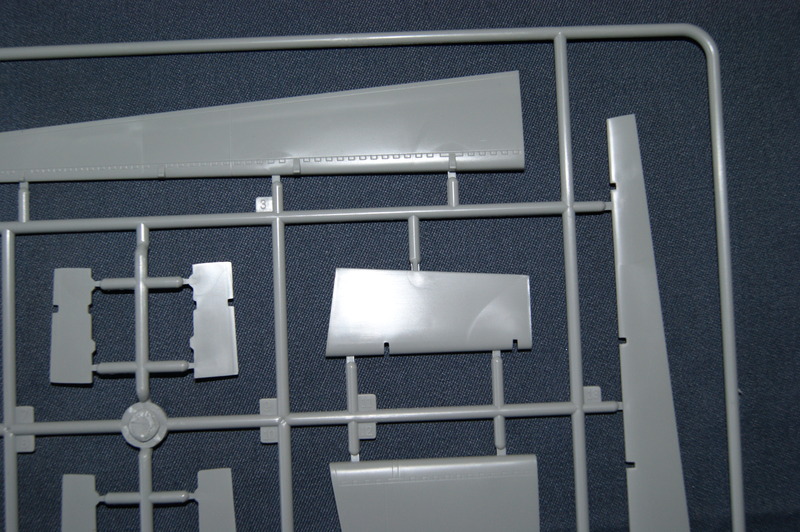 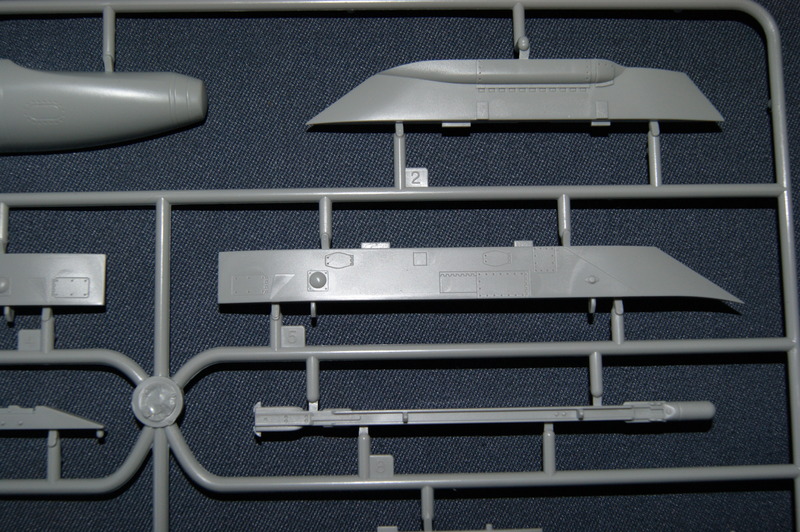 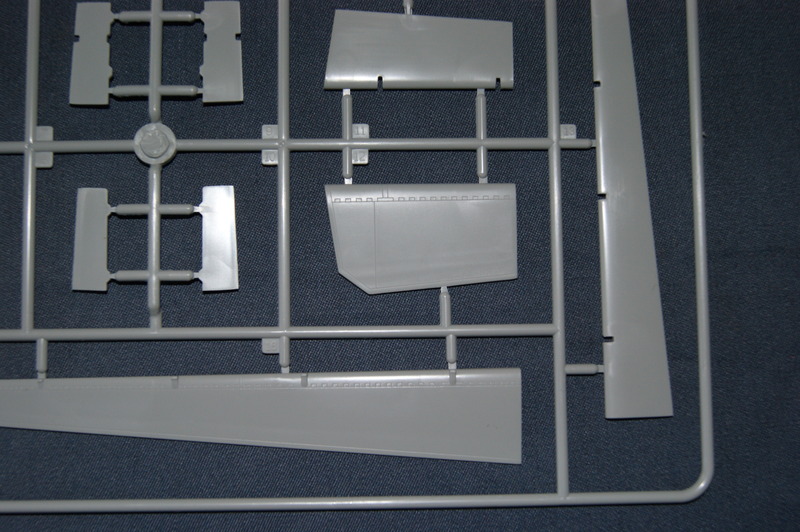 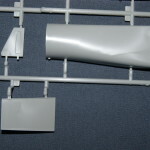 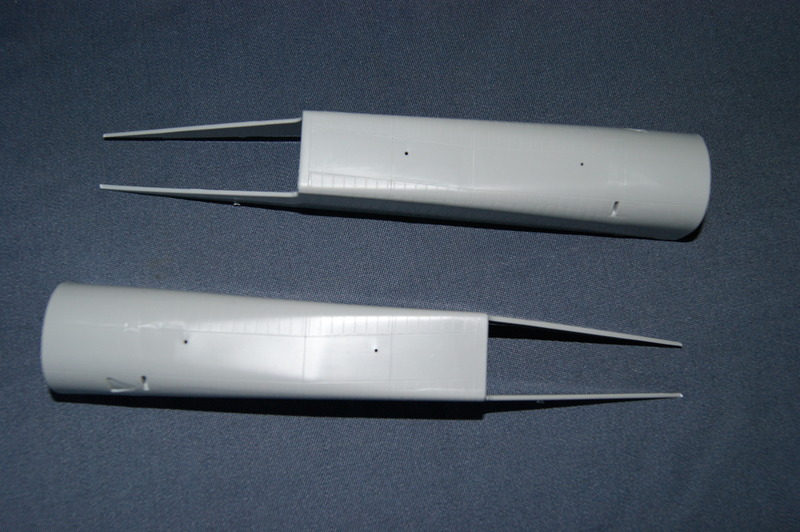 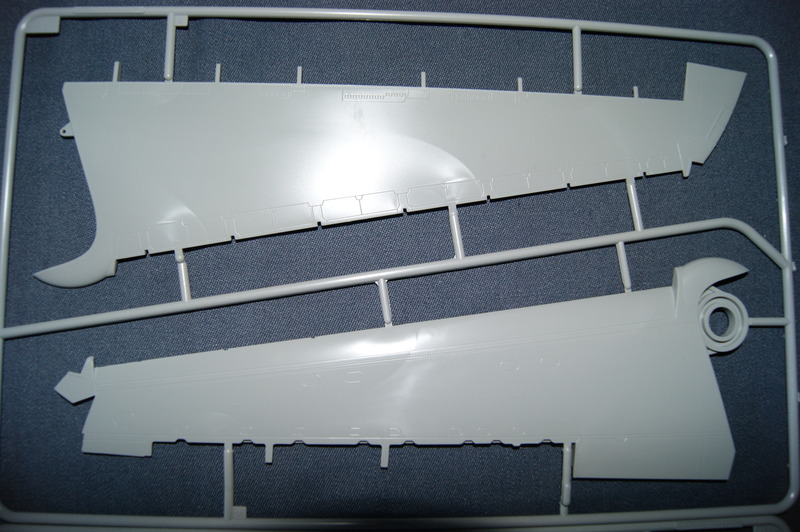 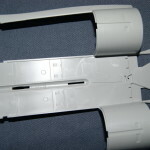 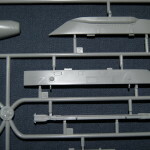 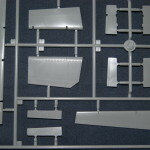 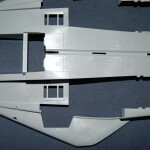 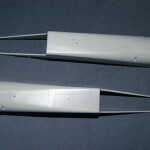 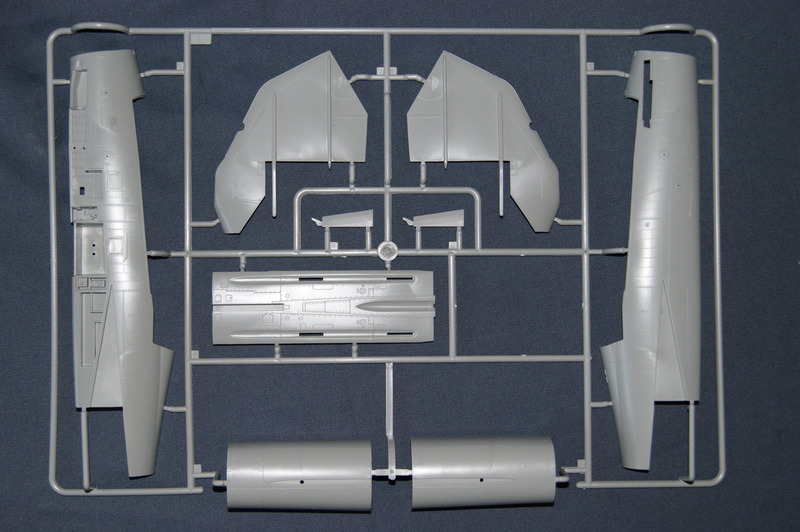 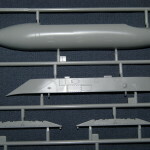 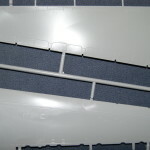 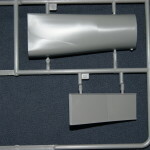 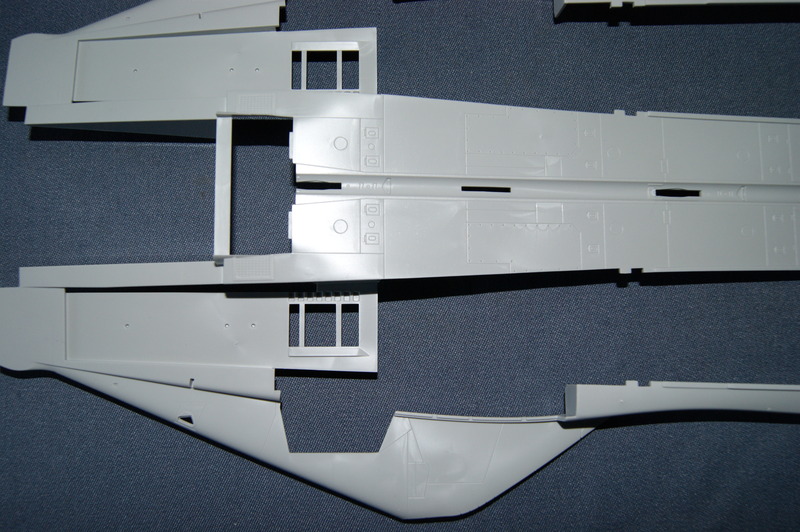 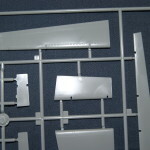 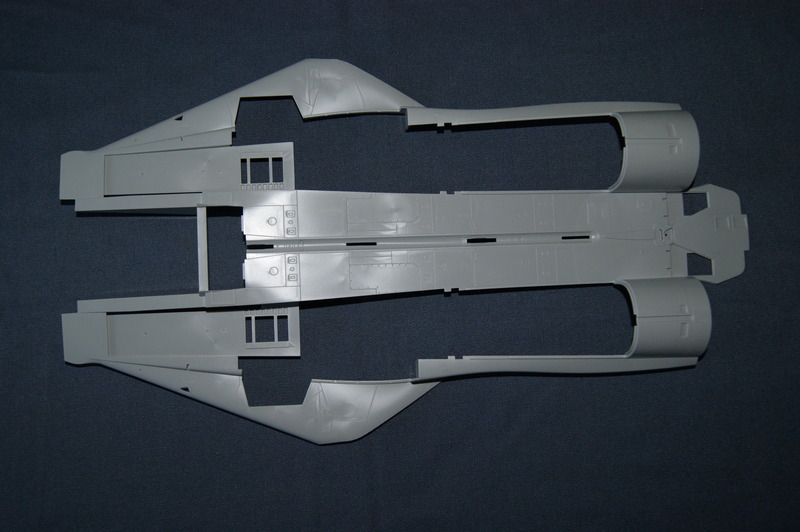 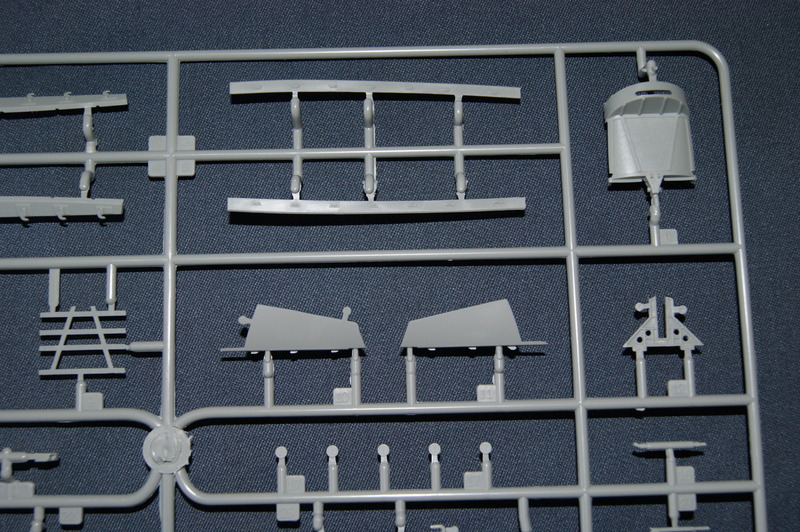 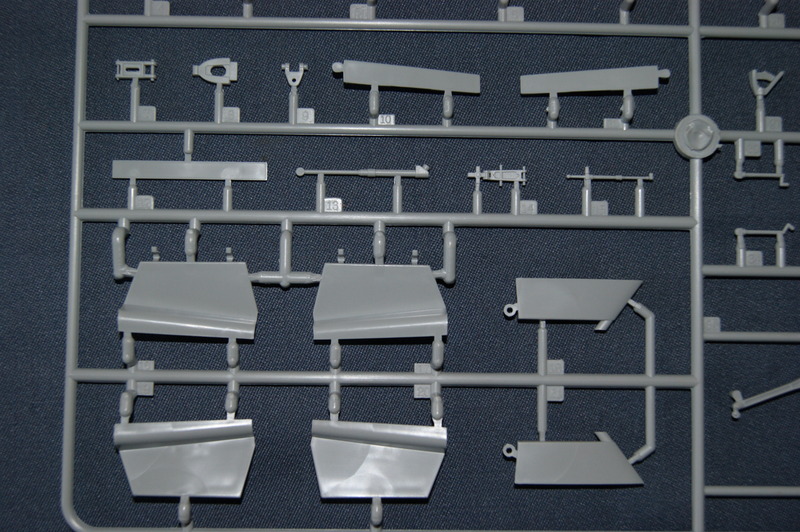 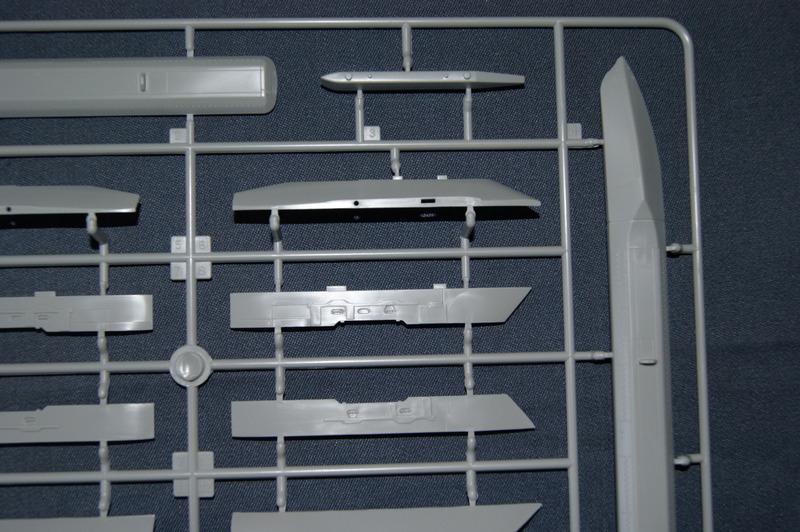 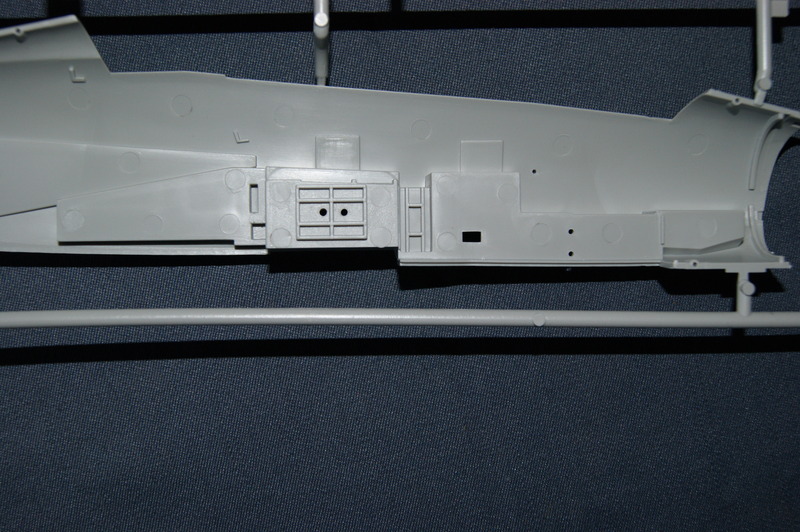 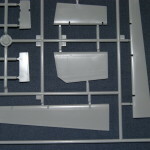 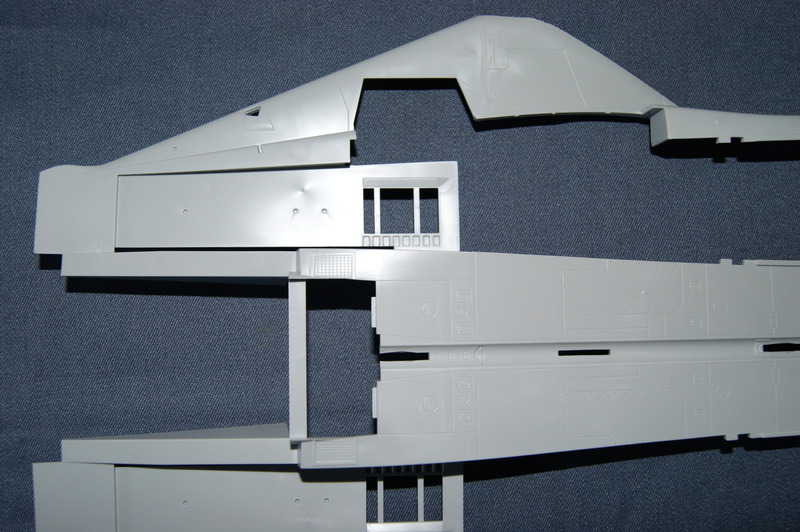 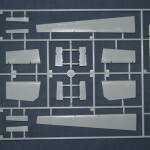 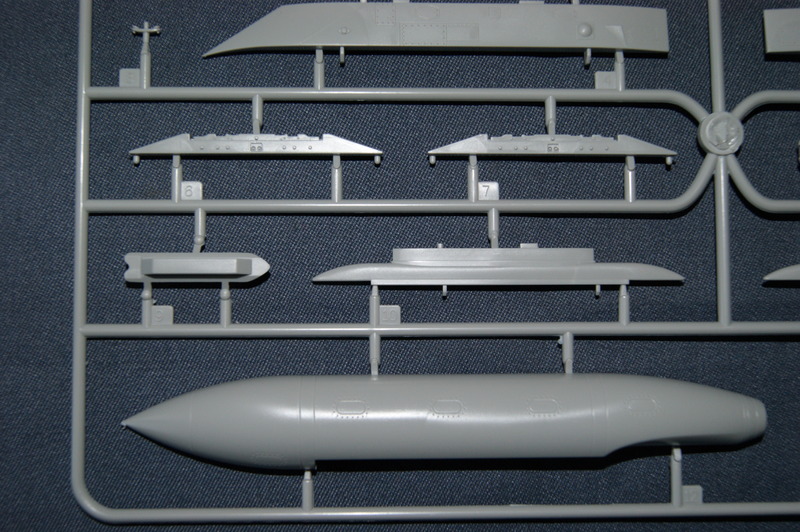 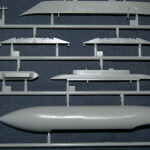 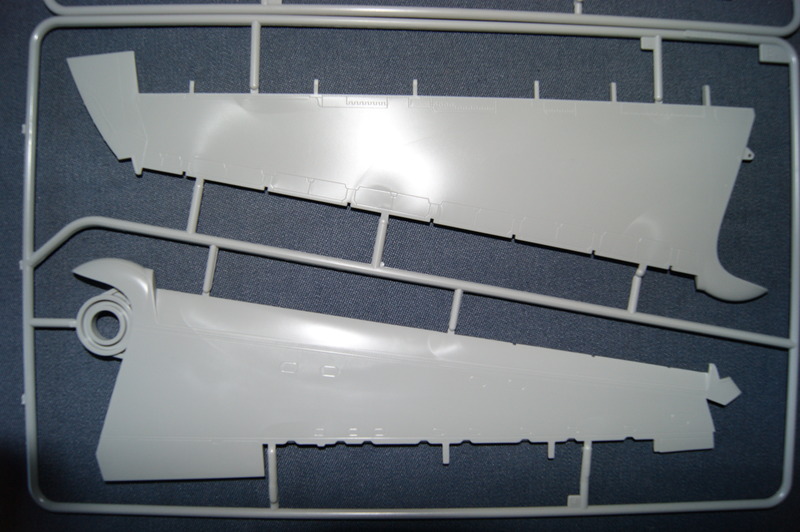 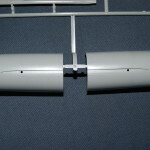 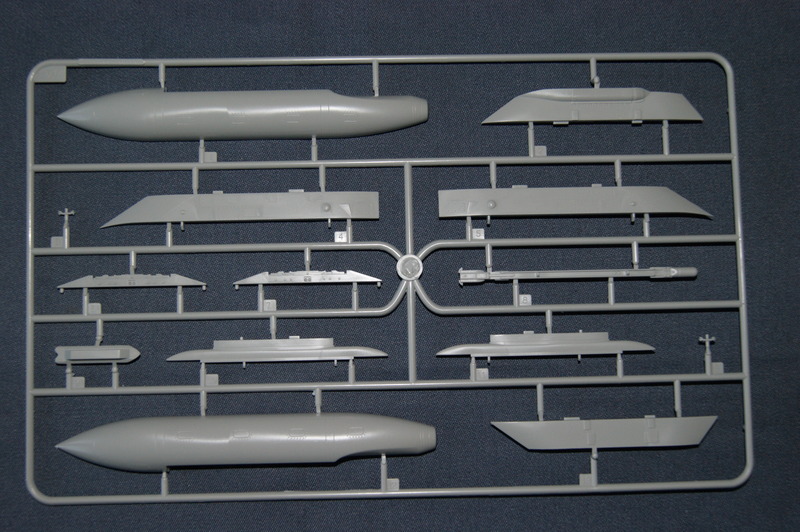 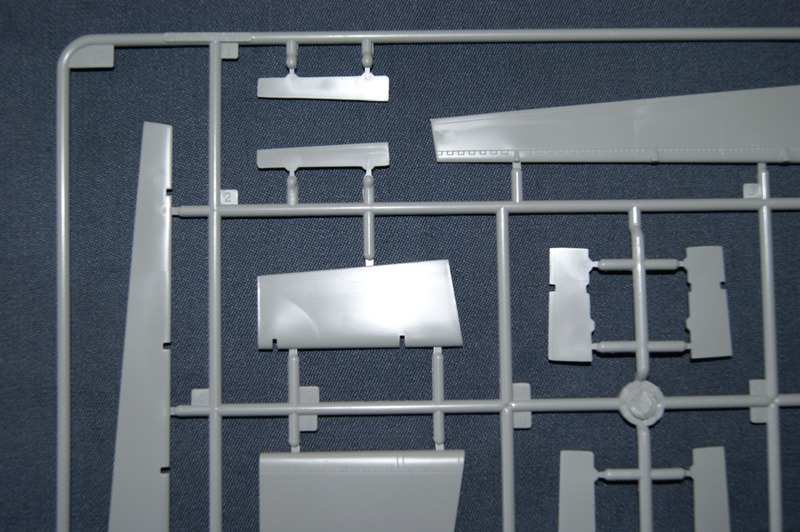 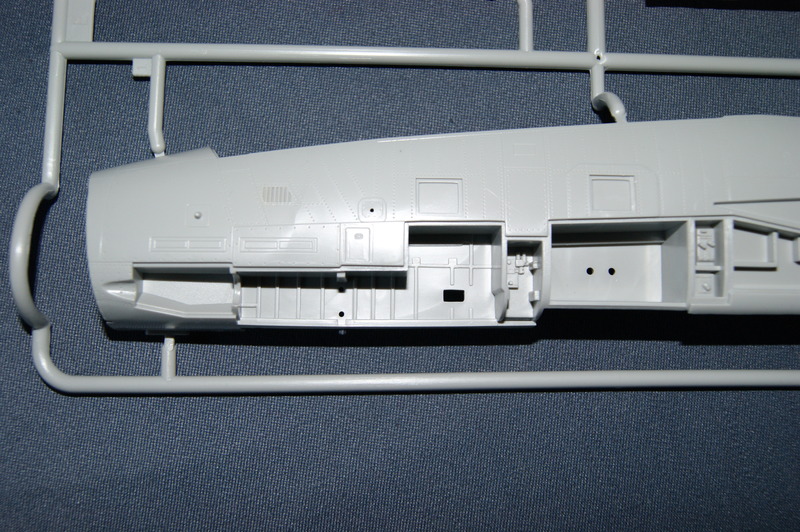 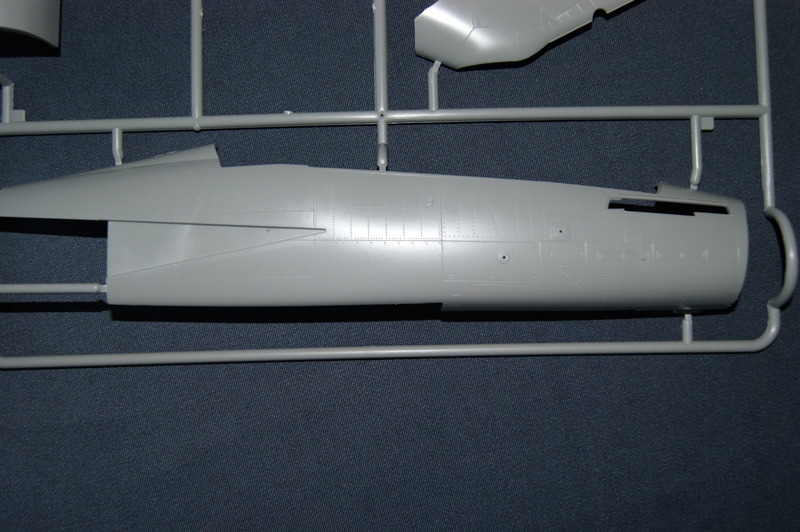 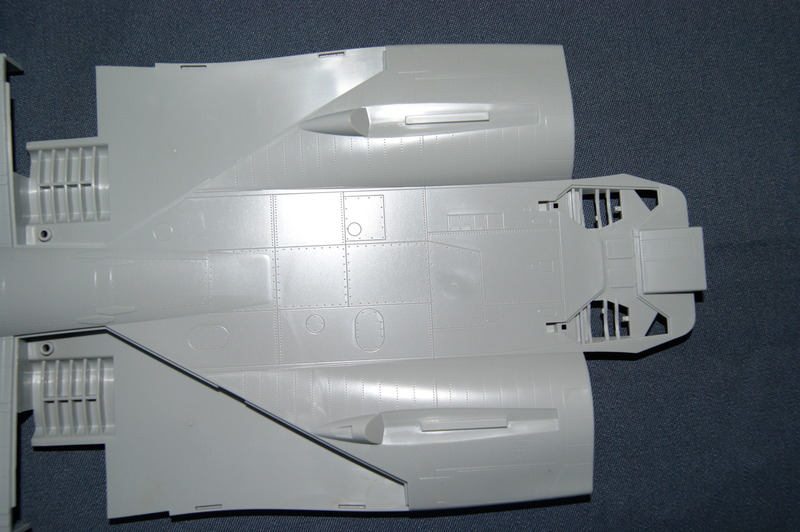 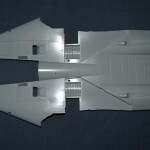 Sprue A: The vertical and horizontal stabilizers. 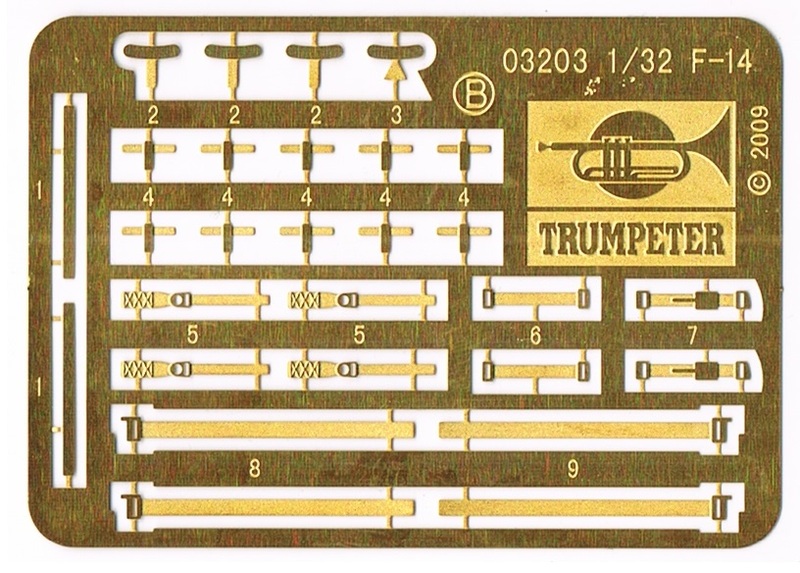 Good detailing and nothing overdone like Trumpeter had a tendency for in the past. 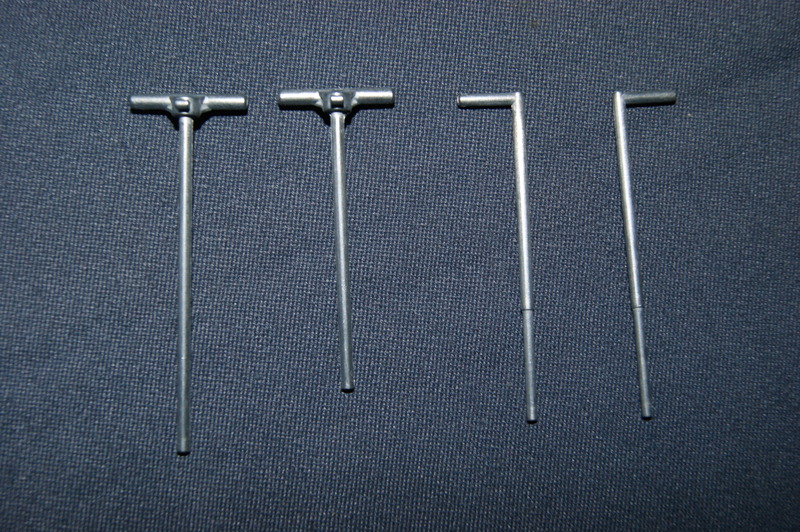 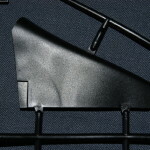 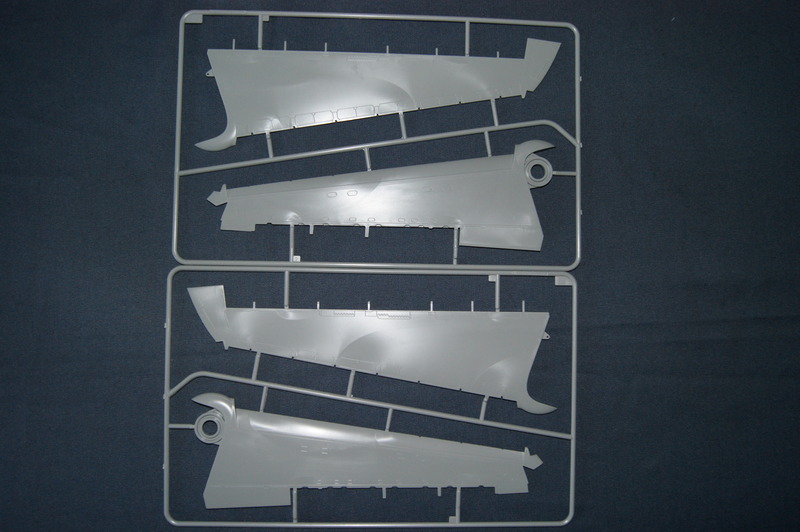 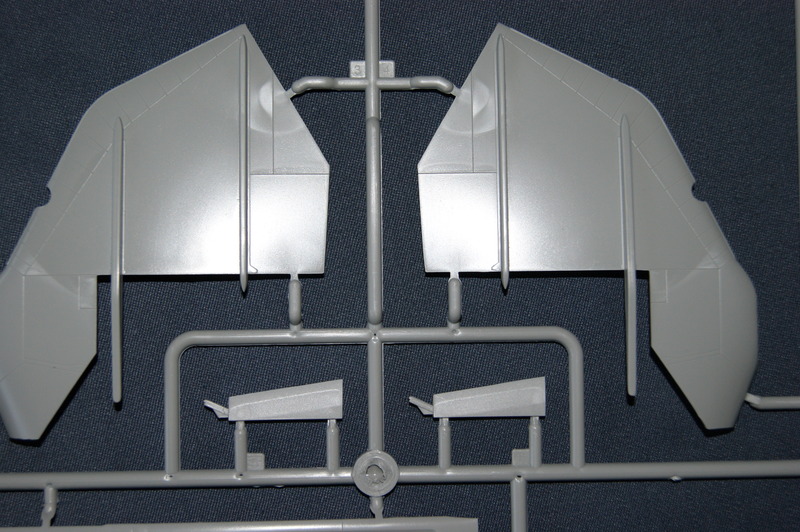 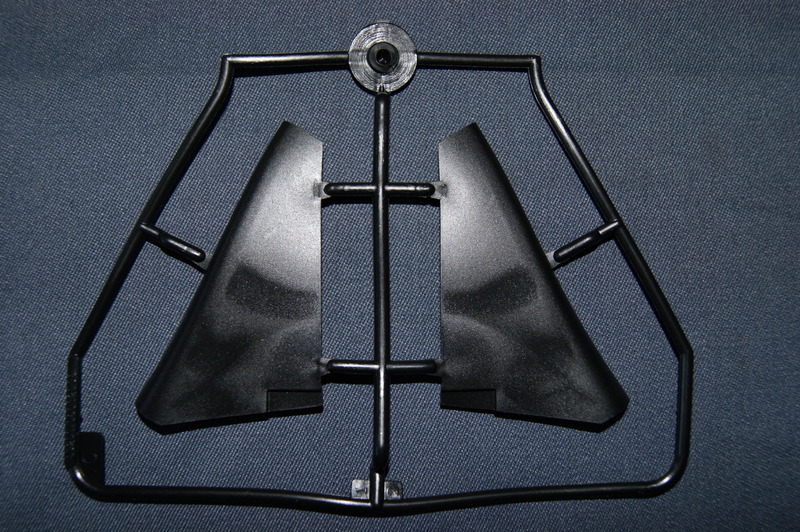 Sprue B (2x): These hold the wings. 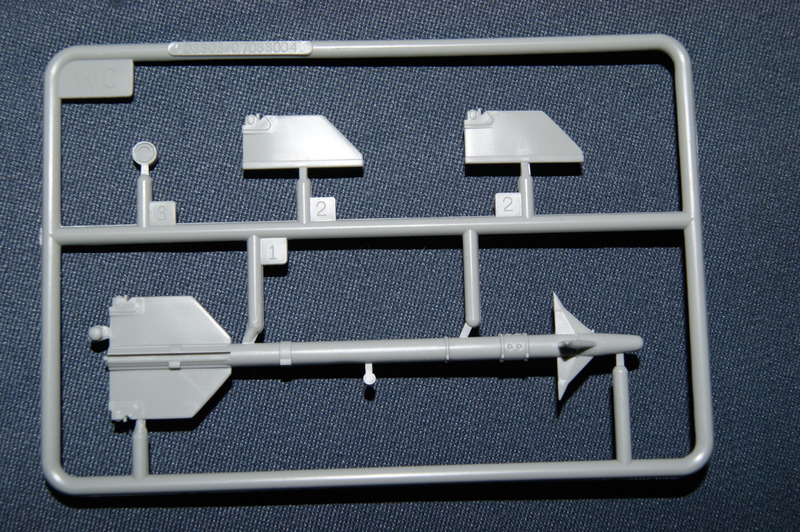 The instructions isn’t really clear about how to position them back, or if they will be moveable (although my guess would be no). 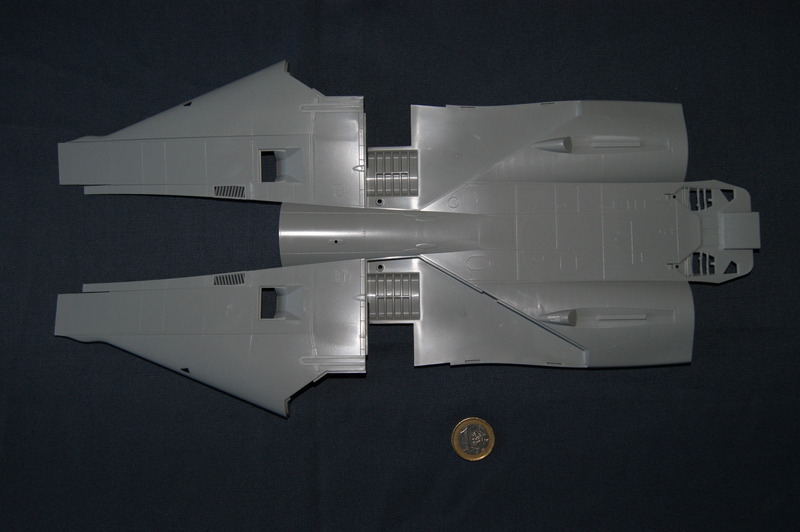 It just says to build it with the wings spread out. 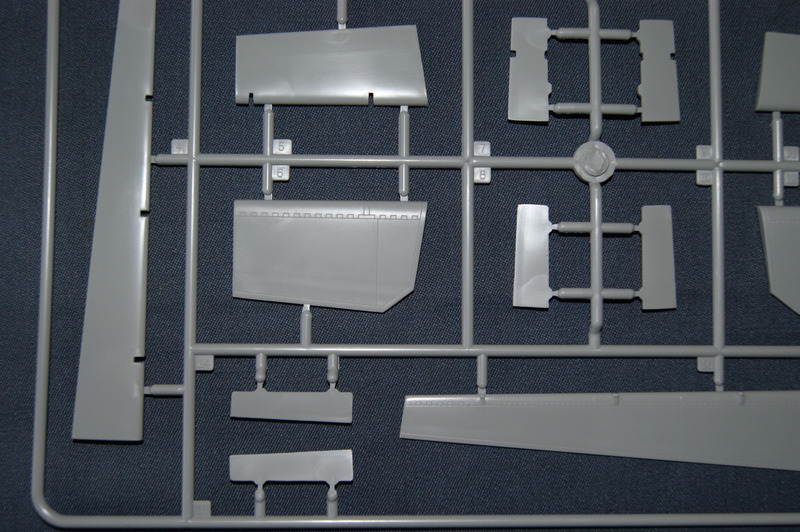 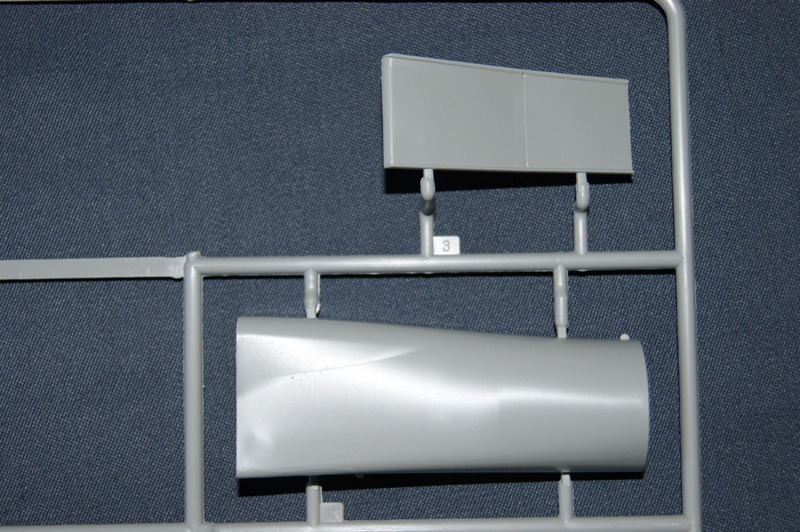 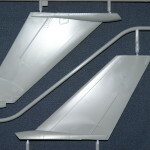 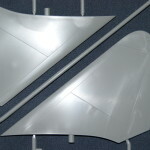 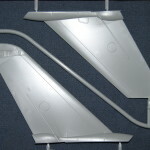 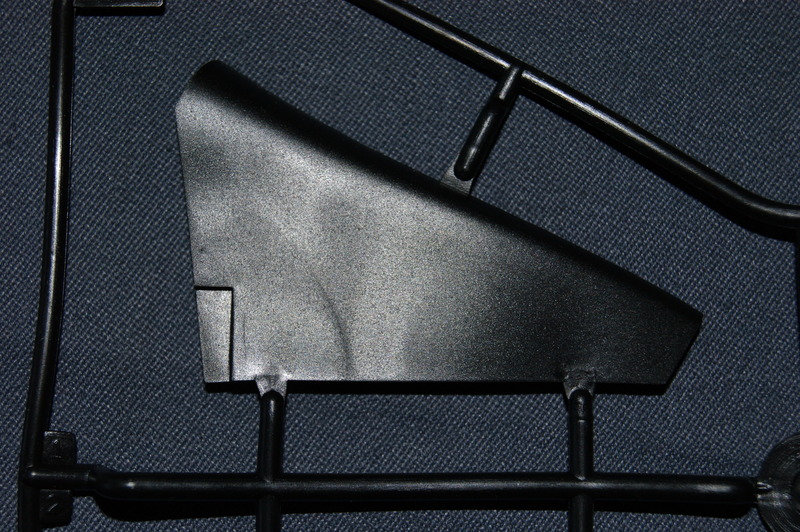 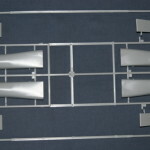 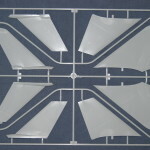 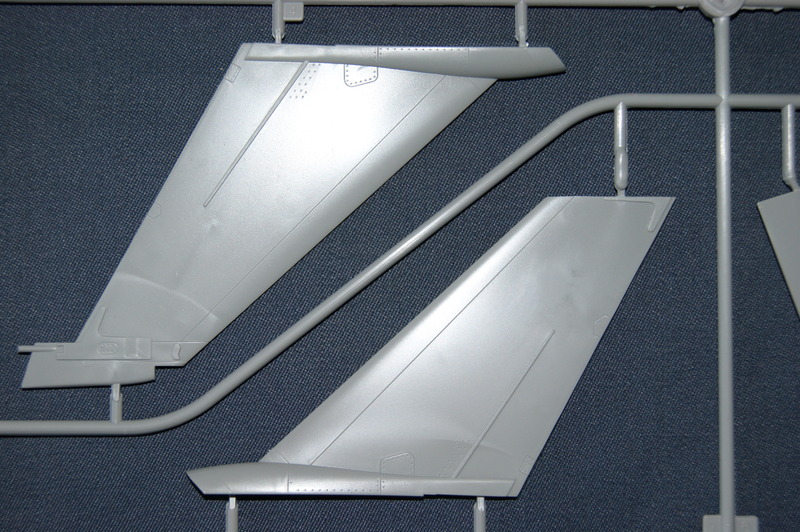 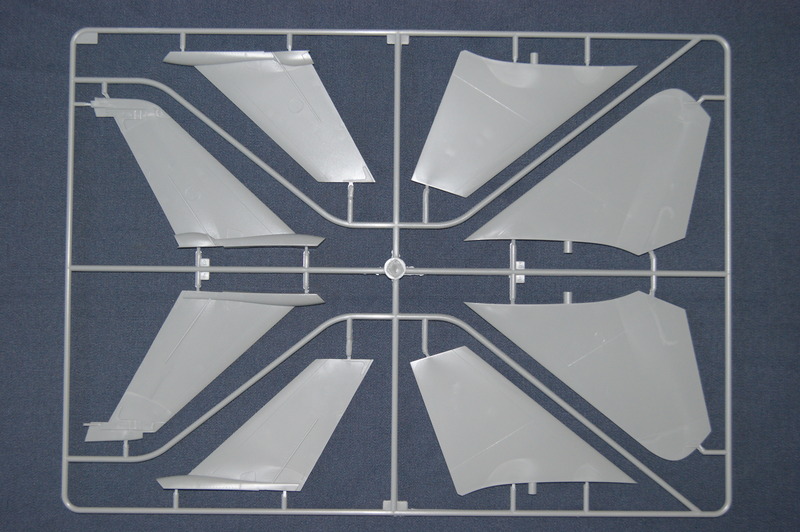 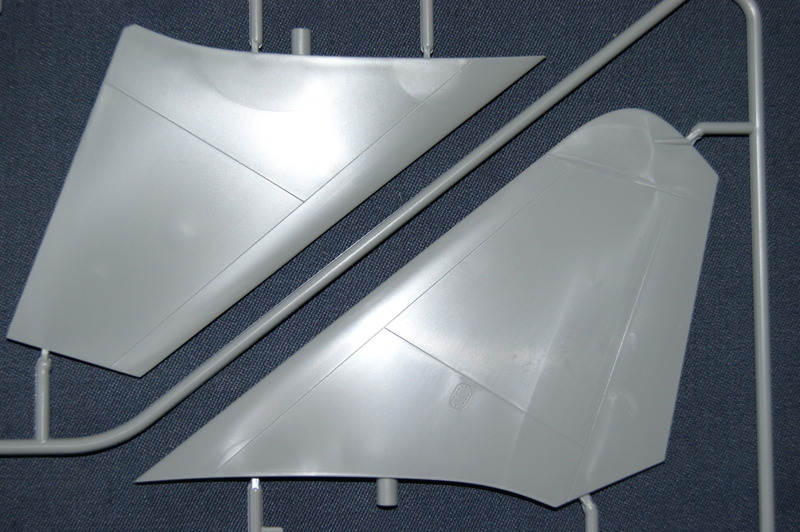 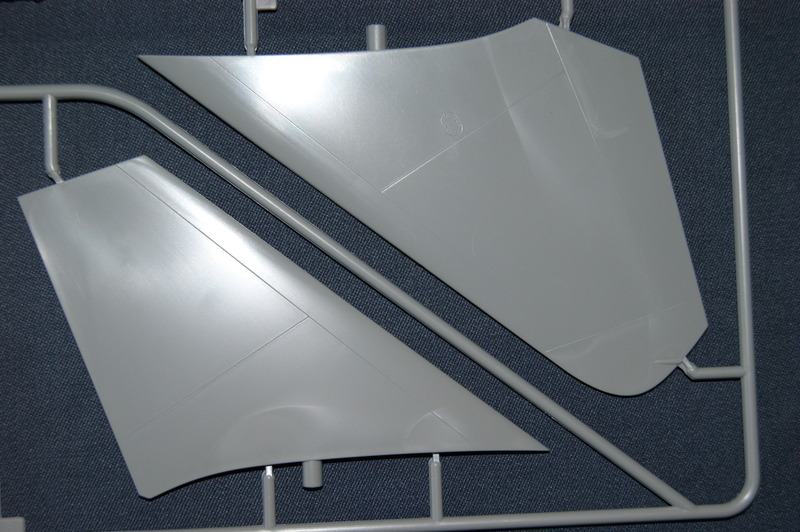 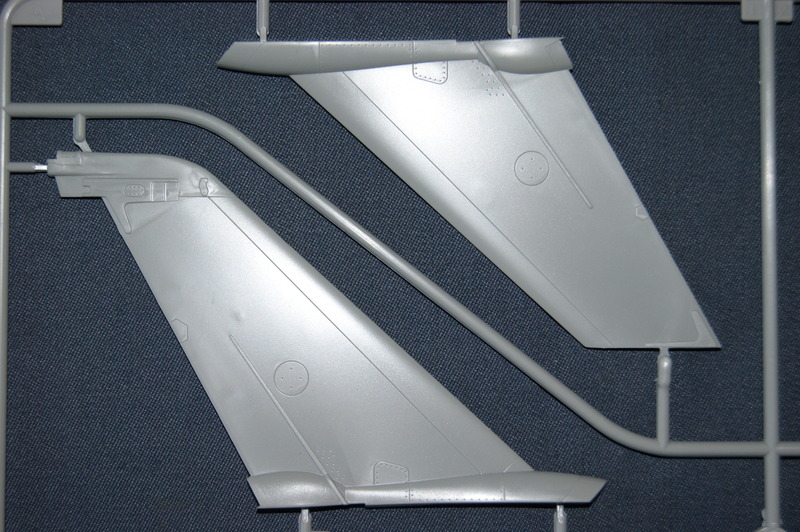 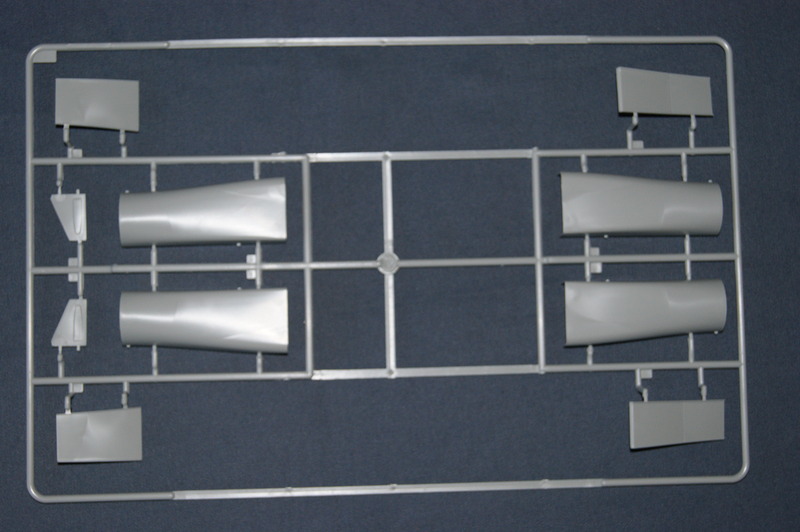 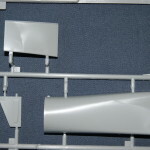 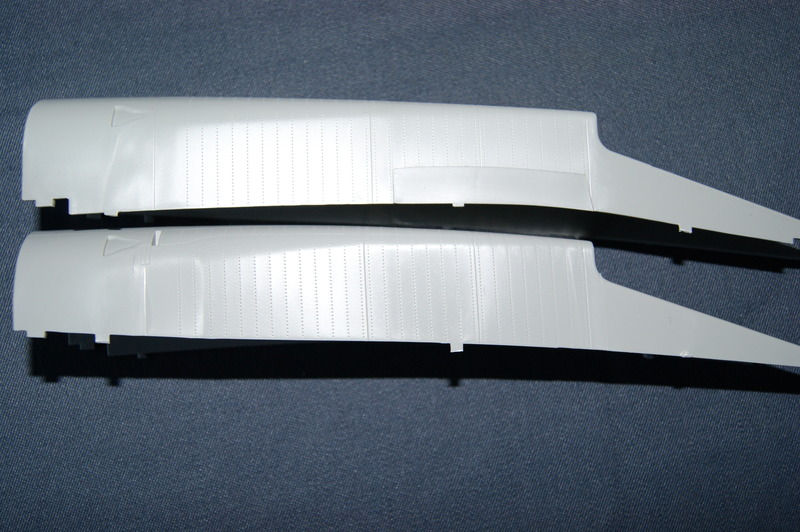 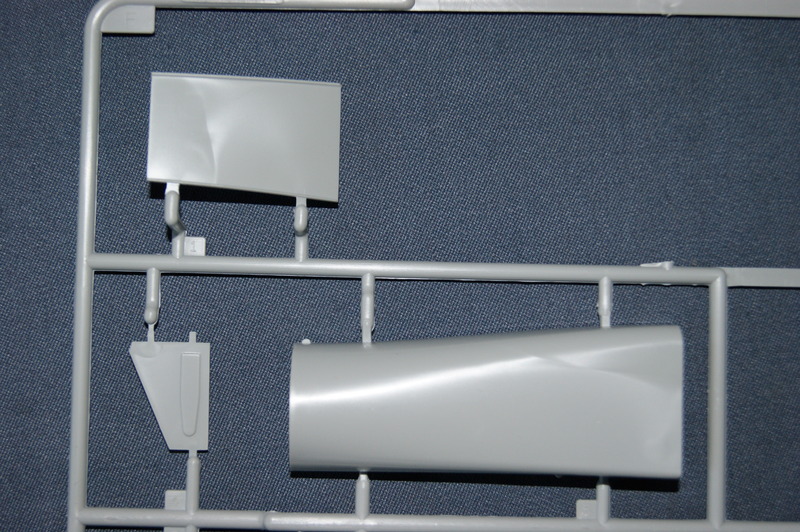 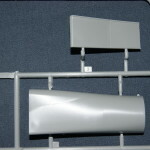 Sprue C: Slat and the vertical stabilizers that go on the rear vertical wing. 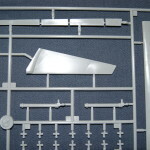 And other small parts for the wings. 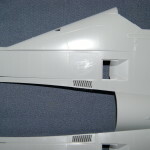 It also contains the hydraulic system for the sweep wings. 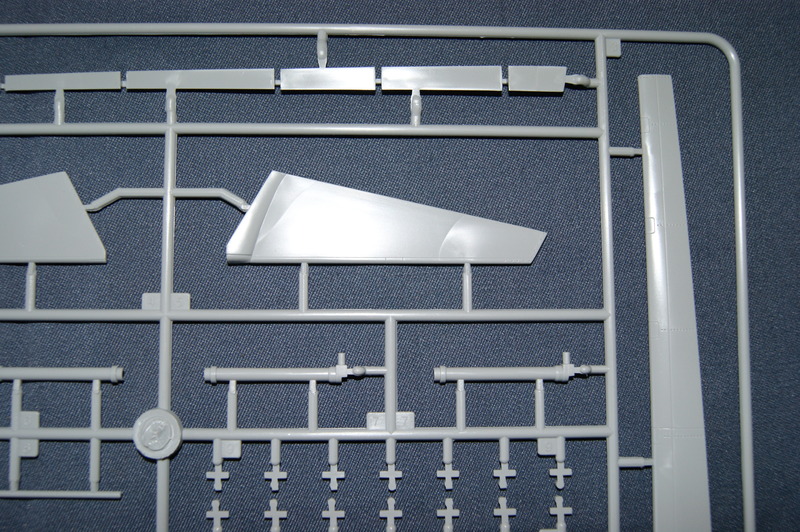 In addition to the question mentioned at sprue B could point out that the wings can be repositioned when the model is finished, but I probably won’t know for sure until I’m at that point in the build. 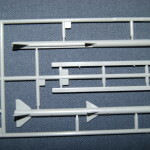 Sprue D: Flaps and ailerons etcetera. 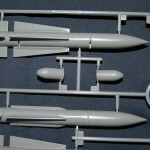 Again the instructions don’t mention it, but these can be positioned to your wishes. 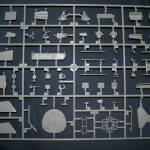 Sprue E: This is a bigger sprue on which the cockpit section probably is the most eye catching. 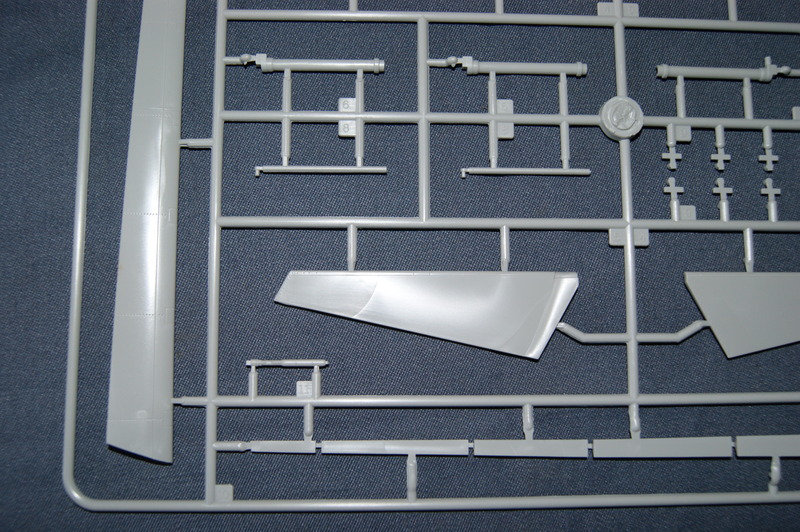 The rest of the parts will be placed on the underside of the fuselage like for instance the parts for the intakes. 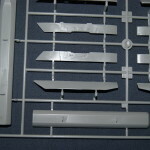 Again you can see the beautiful detailing here. 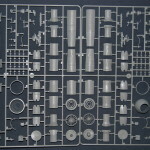 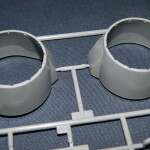 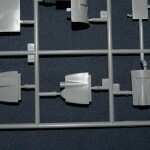 Sprue F: This sprue holds the parts for the intakes. 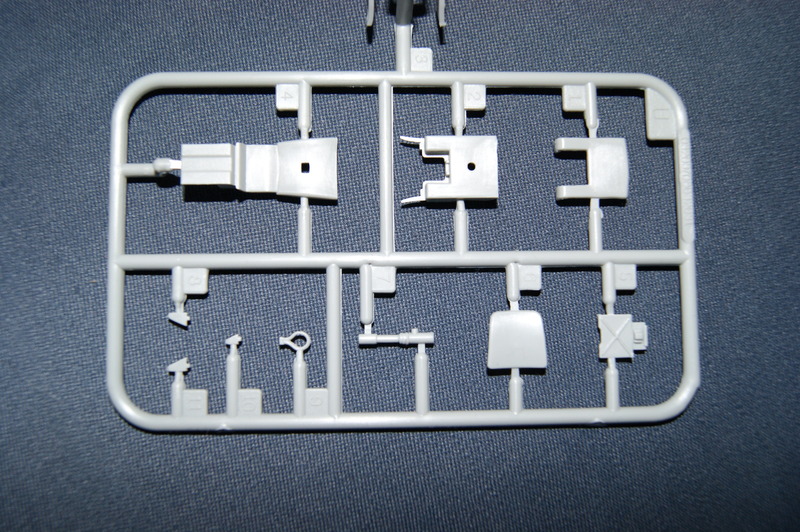 It has some gaps in the sprue, I’m guessing that there were parts suitable for another version on there but I don’t know this for a fact. 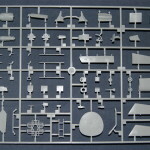 Sprue G: This sprue holds a number of smaller parts. 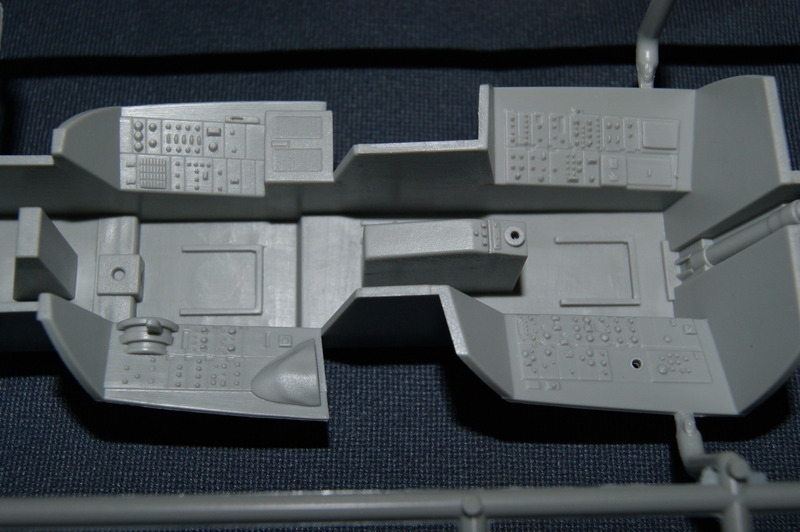 Some of the more interesting are for the cockpit interior. 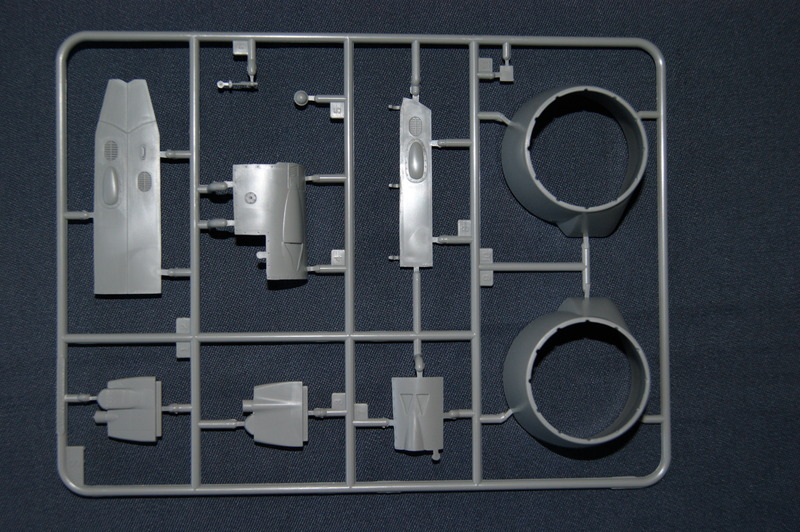 There is no doubt in my mind that even straight out of the box this cockpit will look lovely when you take a look at these parts. 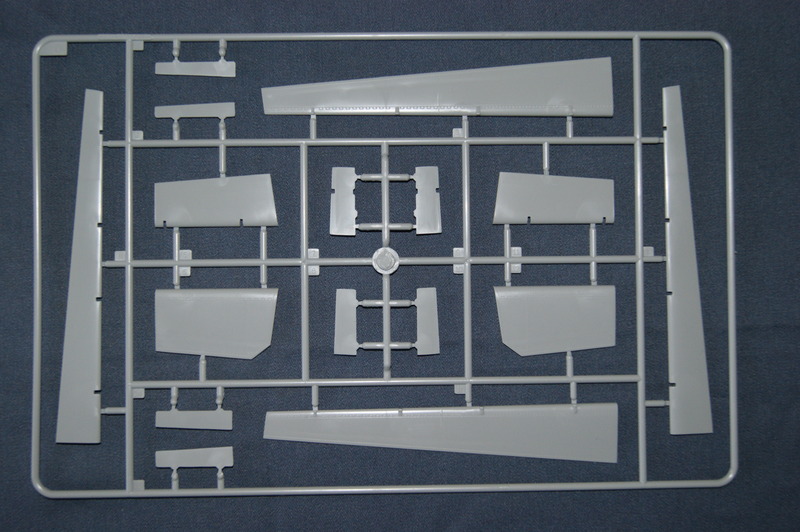 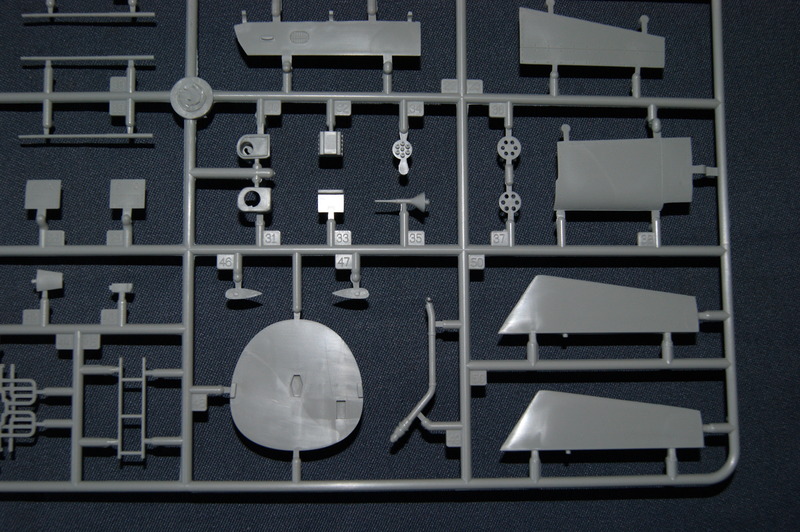 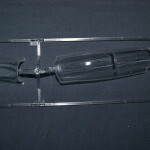 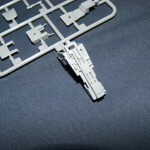 Sprue GP: This clear sprue comes from the box in box which is common with the larger scale kits and holds the canopy and the front windscreen. 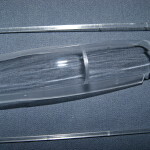 Along with the larger seams which belongs there, there is also a little seam which probably can be polished out fairly easy. 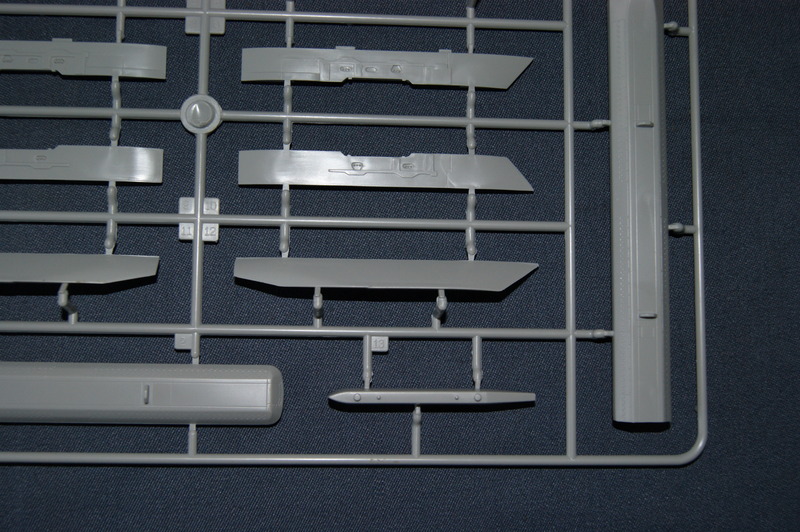 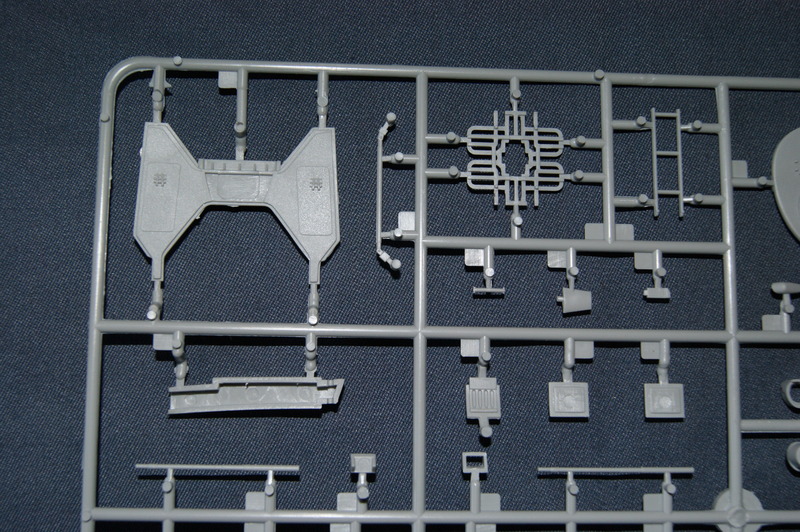 Sprue H: A lot of smaller pieces on this sprue, mostly for the interior bays and hatches for those bays. 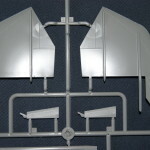 There are also some parts for the radar here as well as some very nice pitot’s. 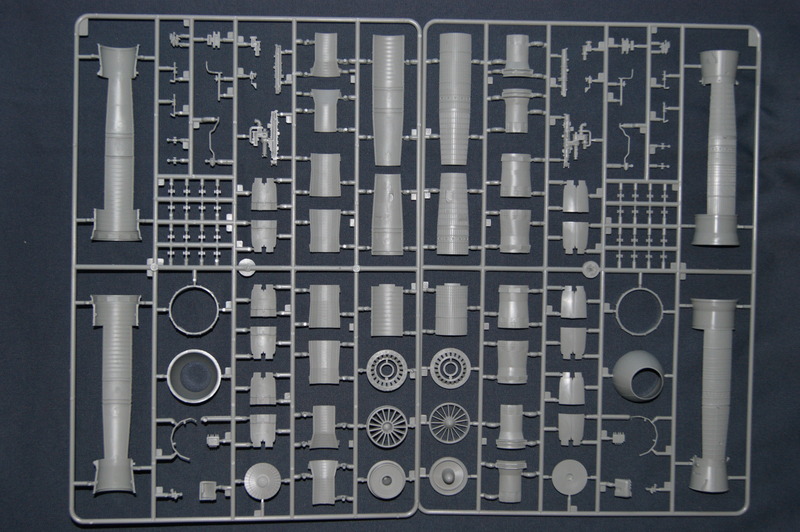 The 20mm Vulcan canon is on this sprue as well and by the looks of it you probably don’t need an aftermarket set for this part either. 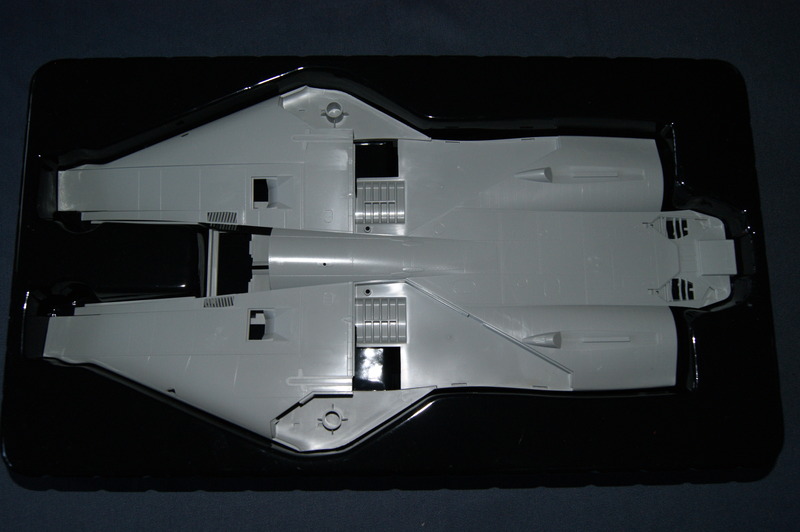 The biggest part on here is the airbrake which looks nice but needs a little touch up. 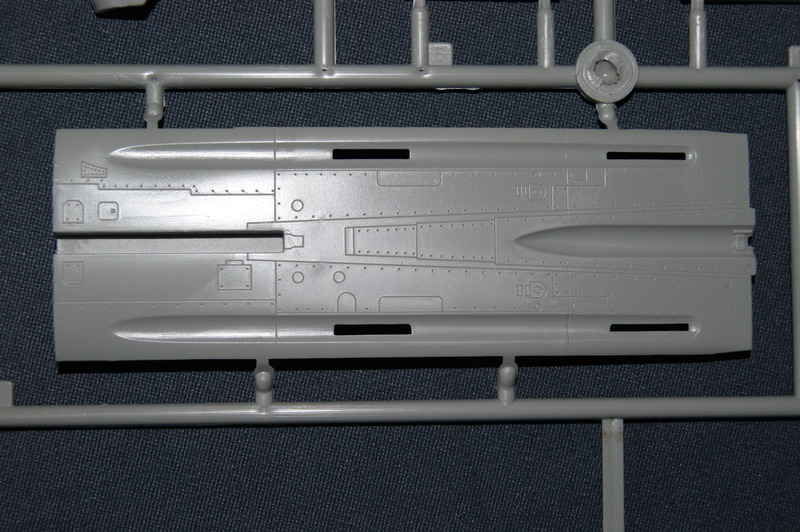 On the downside, there are some fairly large sinkmarks on some of the parts where they might be visible. 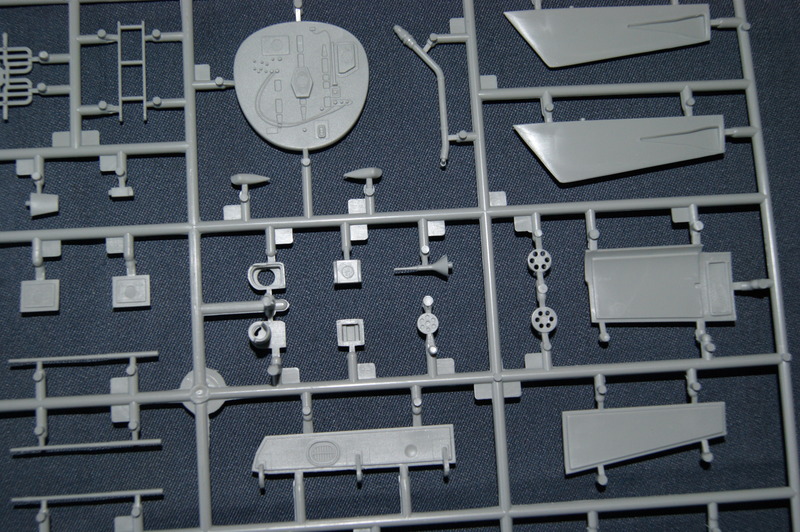 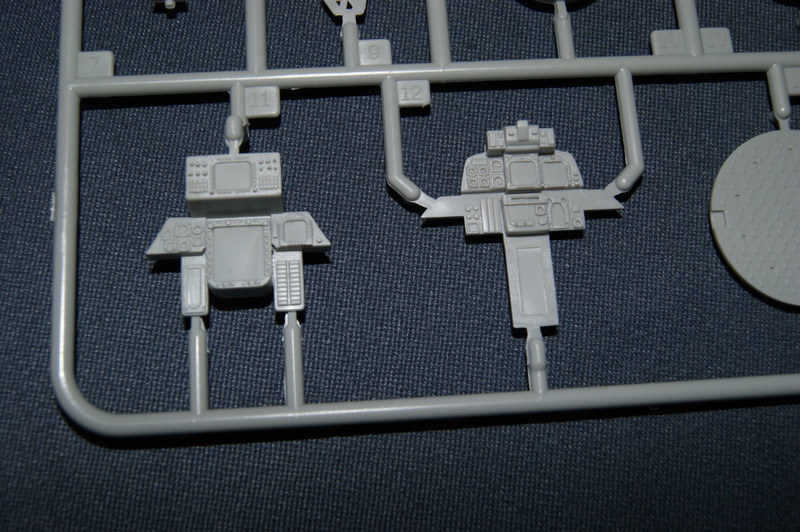 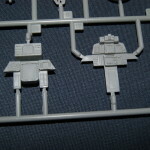 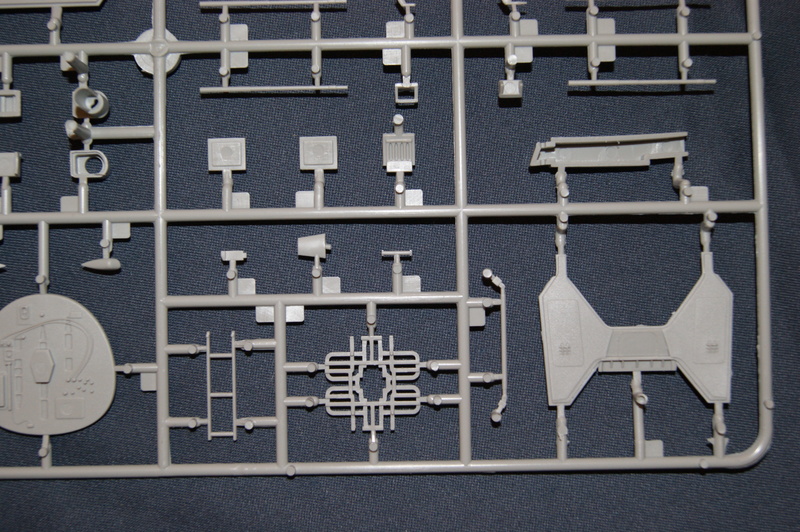 Sprue J: The first parts that catch your eys on this sprue are probably the landing gears which looks nice. 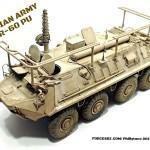 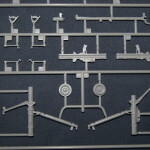 You build them around a metal part which holds the weight of the model. 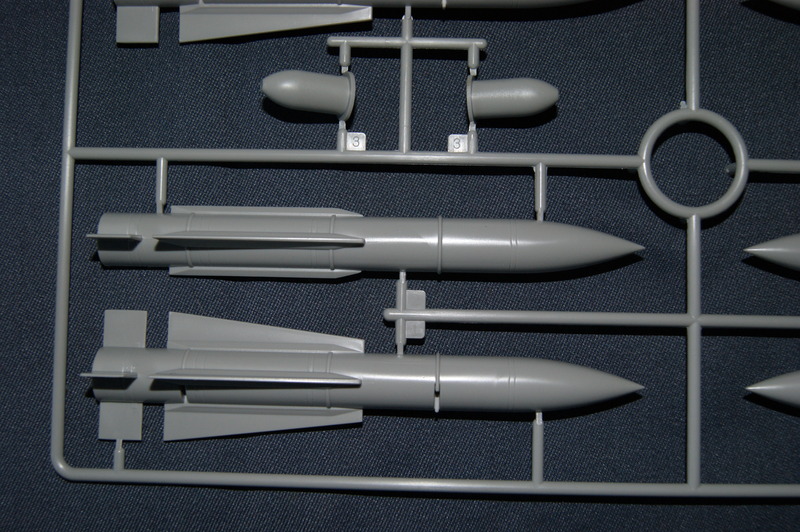 There are options here as well, you get a short or a long version but more on that later. 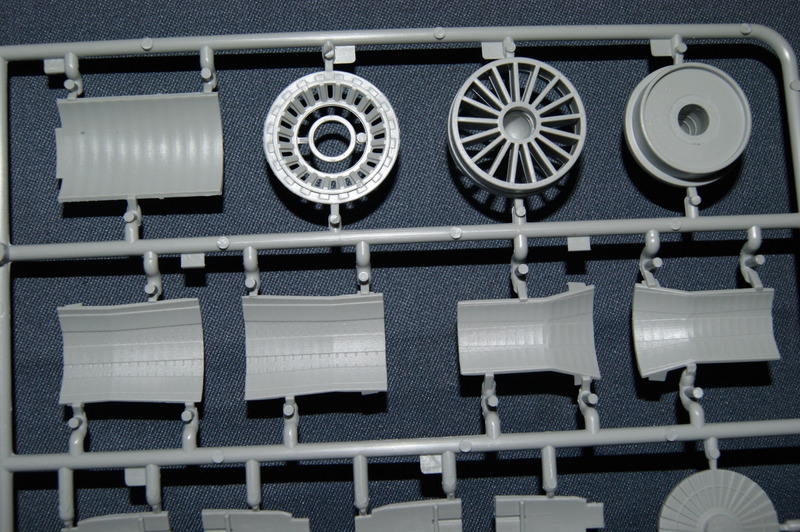 The wheel hubs look decent too. 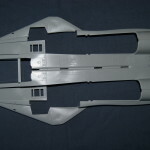 Other parts that stand out are meant for the front wheelbay, these look nicely done with all the wires and extra components and will look nice when finished and take out the need for some of you for getting aftermarket bays. 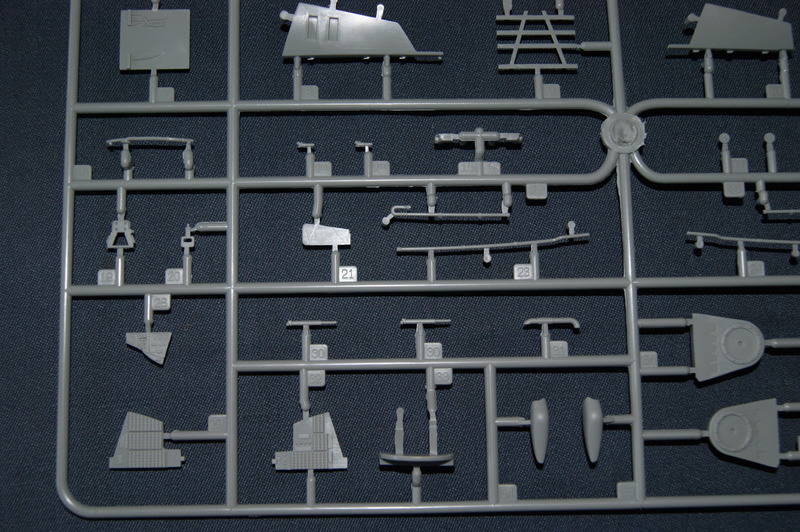 Looking on the other side of the sprue I was really impressed by parts 16, 17, 19 and 20. 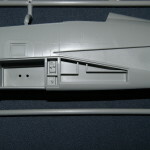 These wheelbay doors look really stunning. 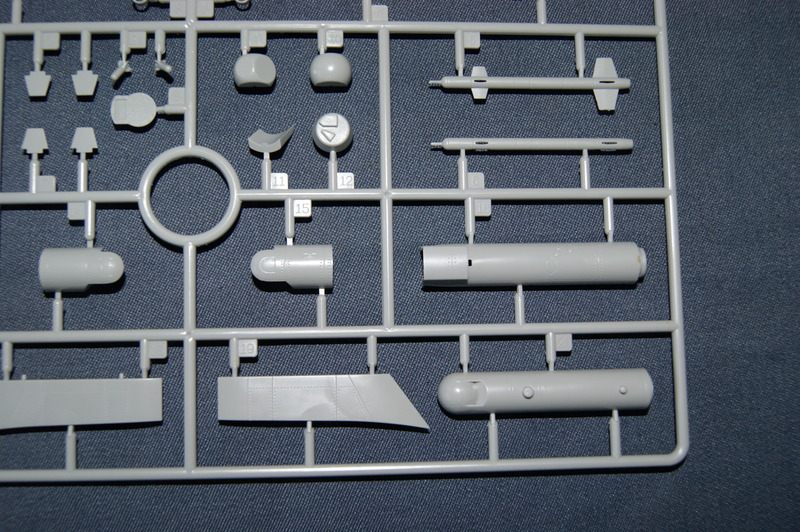 I was a bit disappointed in parts 5 and 6 until I realized that these were the closed options for parts 25 and 26. 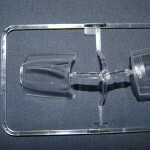 Good thinking there! 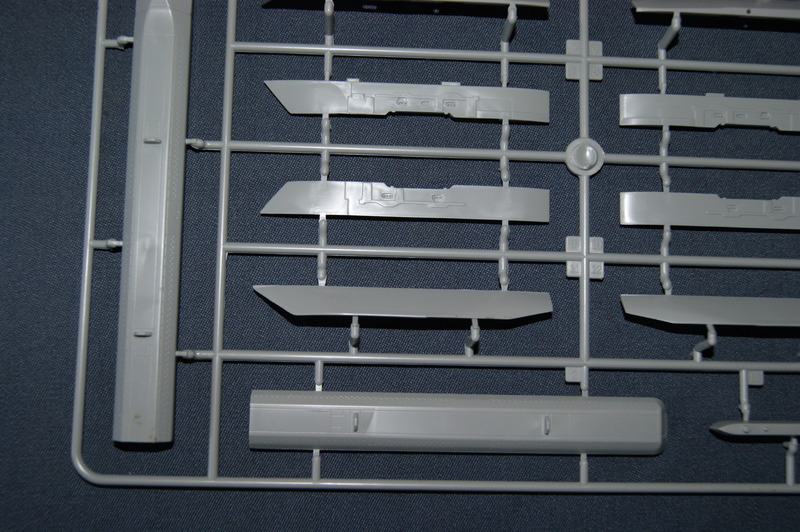 Too bad there are also some sinkmarks on some parts which might be visible. 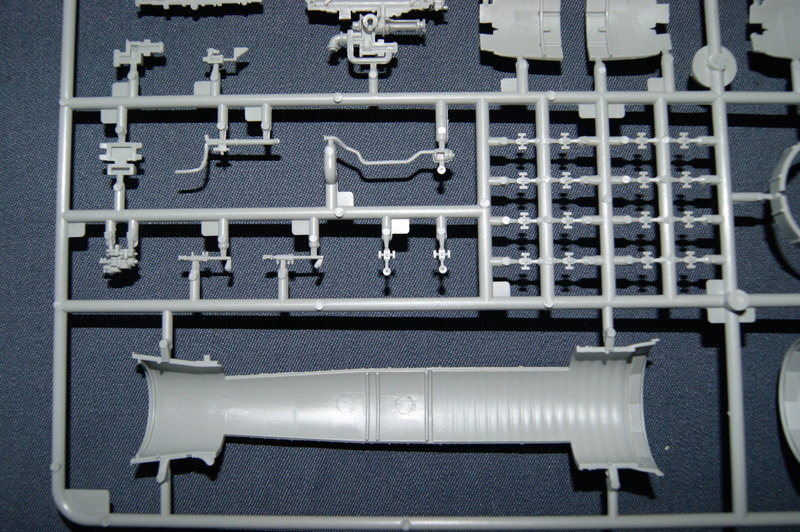 Sprue K: A small ‘wow’ from my side looking at the undercarriage parts on this sprue. 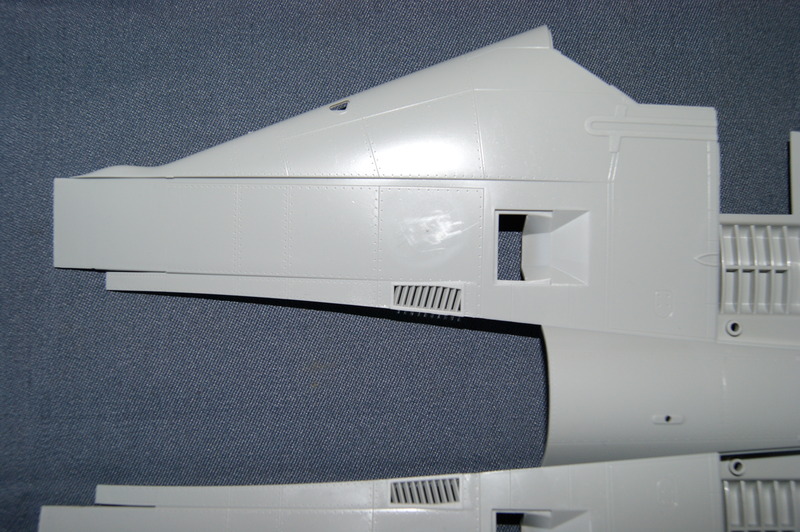 They really stand out and will look nice when finished, I have no doubt about that. 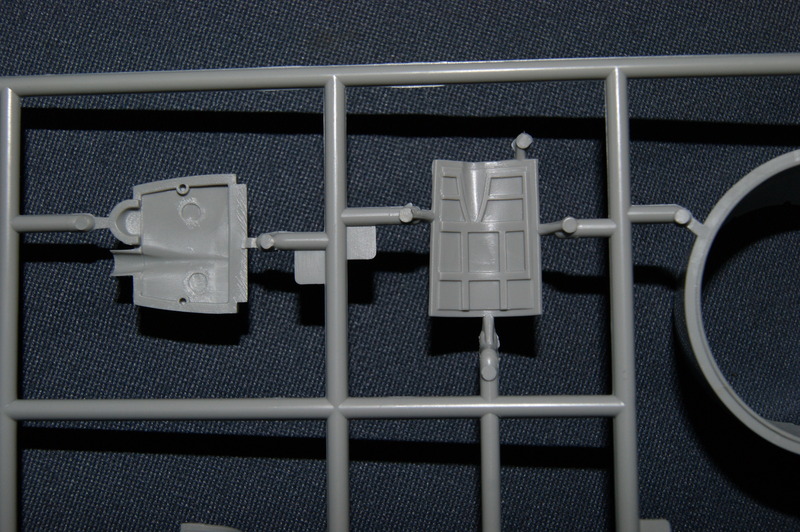 Again great detailing here. 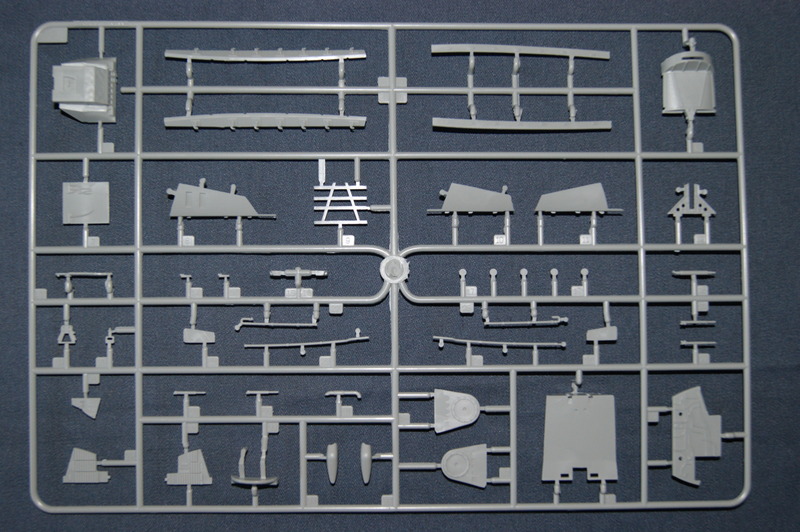 Sprue N: A fairly small sprue with some nice parts on it. 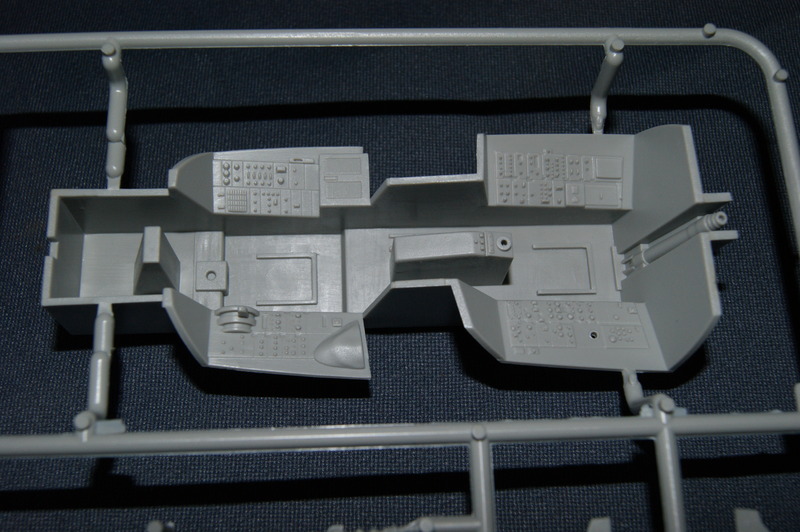 The biggest is the cockpit tub this part actually looks very nice and looking at the instrument panels I am beginning to wonder if the Photo etch set for the interior that I’ve ordered might or might not be necessary. 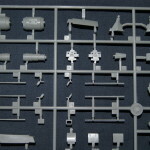 Sprue O: It’s hardly called a sprue because it’s rubber. 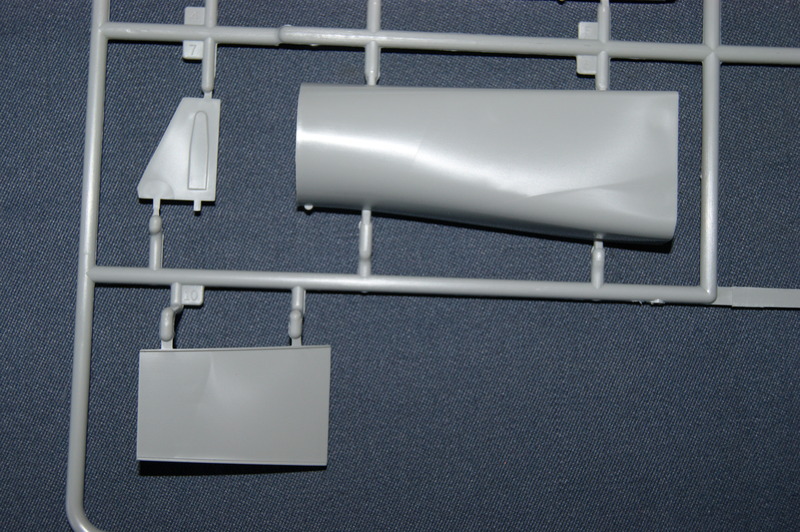 These parts represent the inflatable bags that are partially covered when the wings are in the backward position. 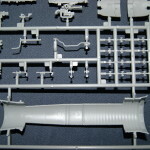 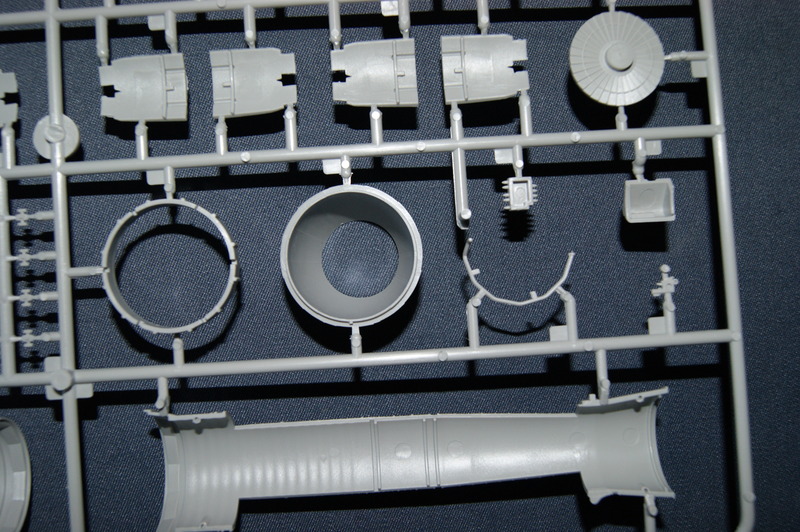 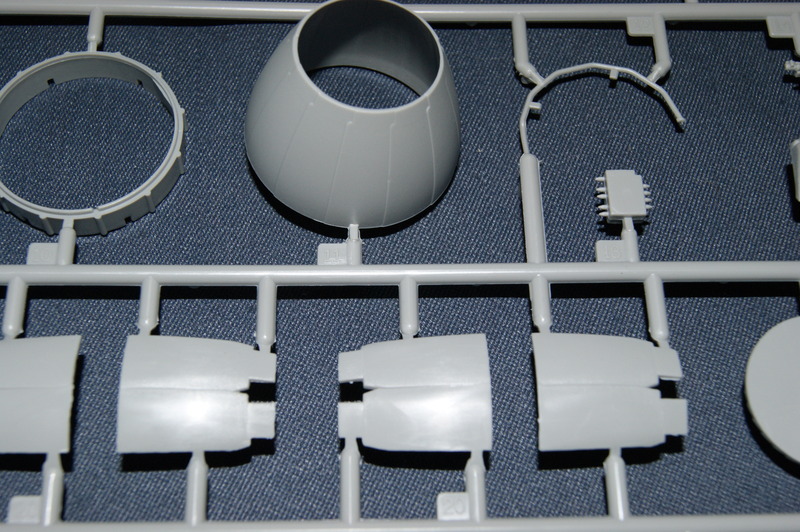 Sprue Q (2x): These sprues are all about the engines and exhausts, and to they look massive! 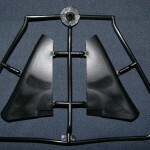 The detailing is superb and you have the options for a closed and open look of the exhaust. 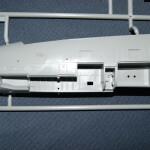 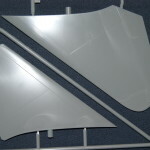 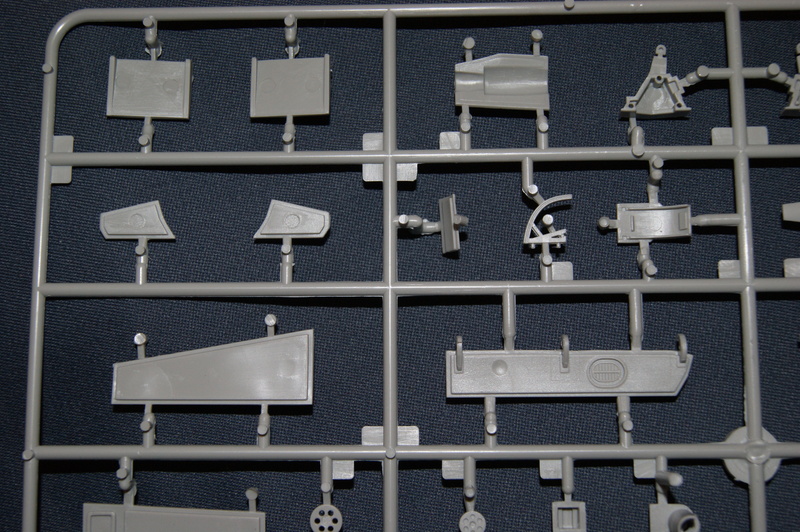 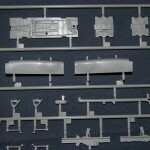 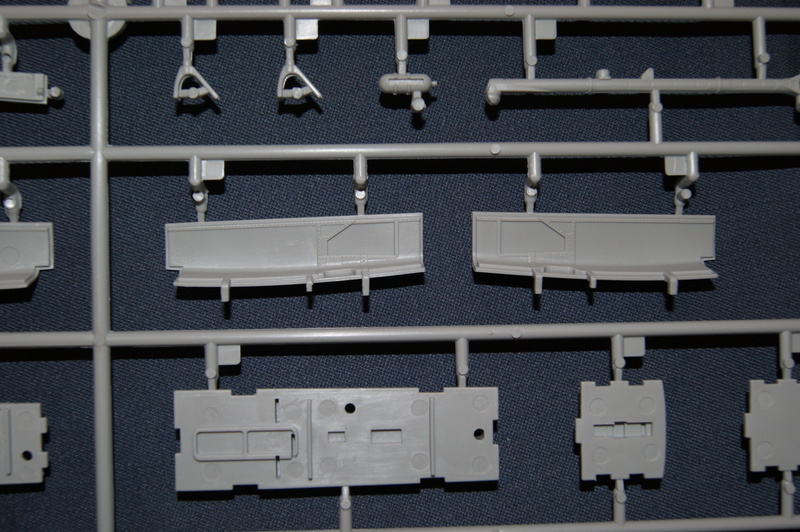 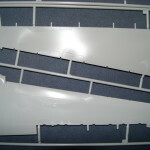 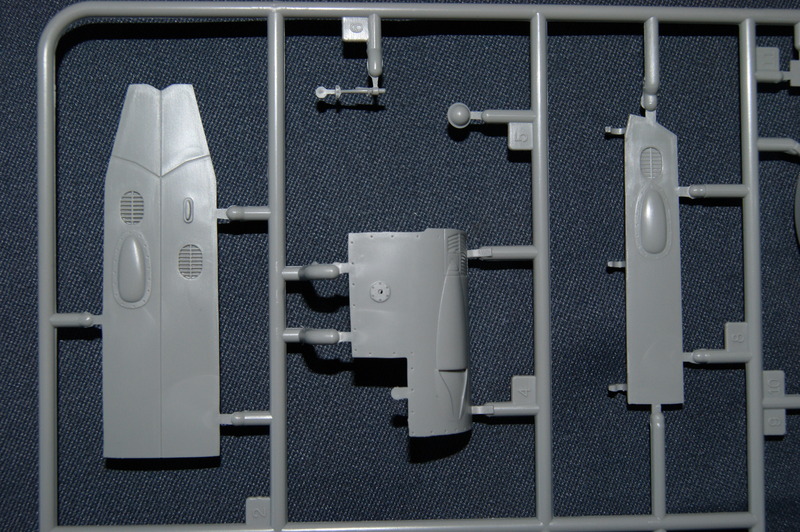 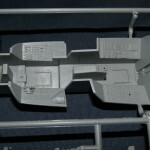 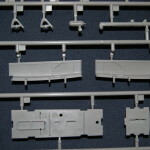 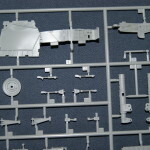 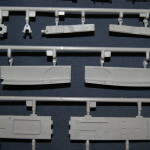 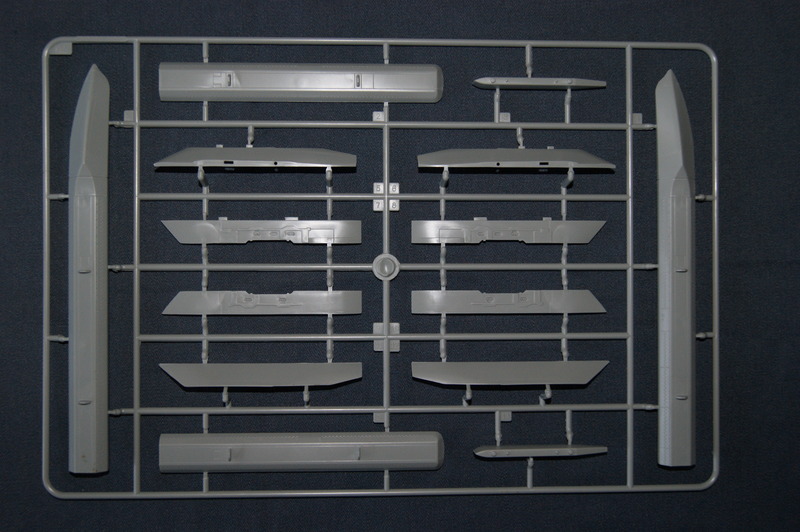 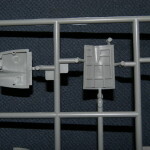 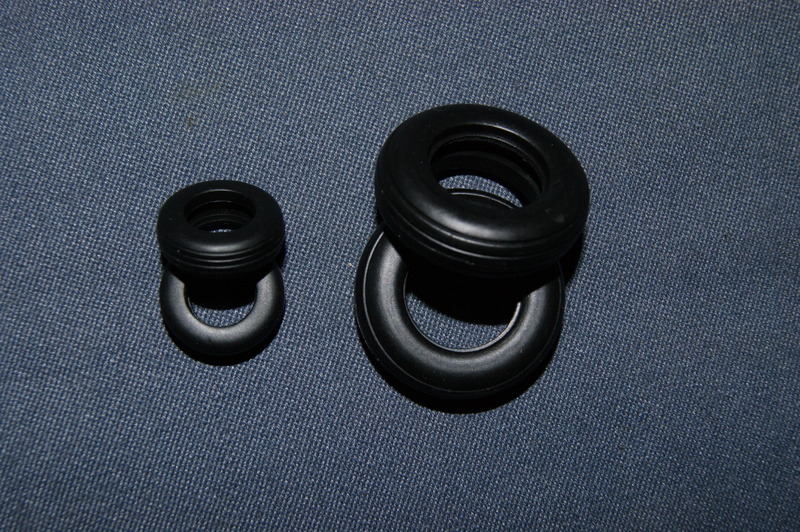 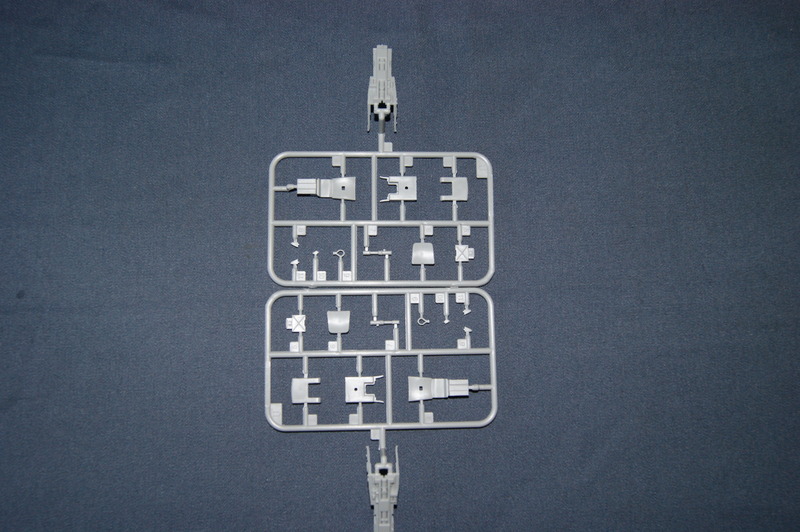 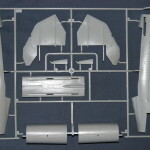 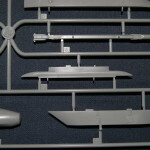 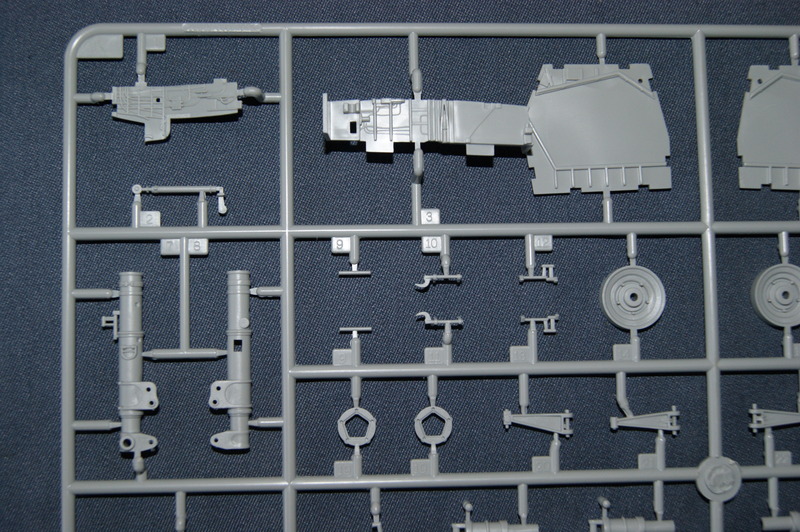 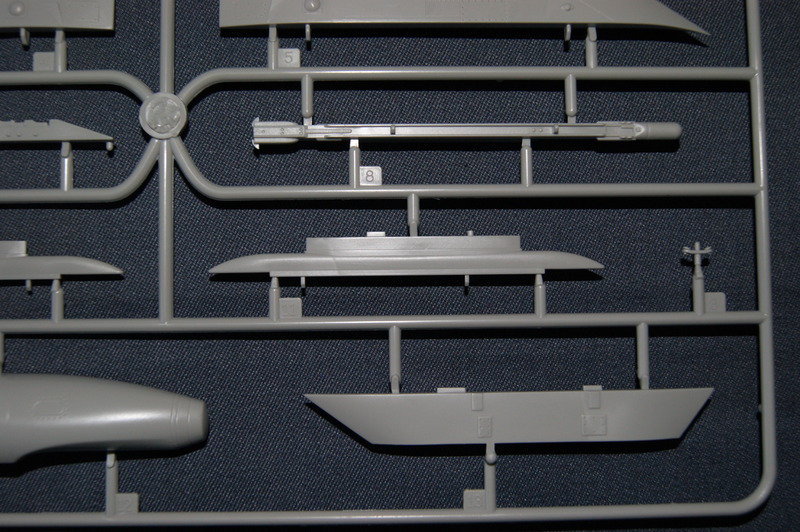 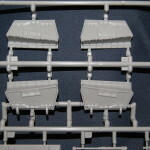 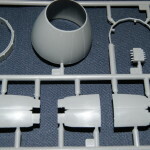 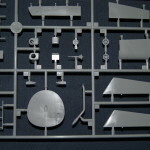 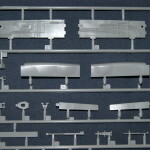 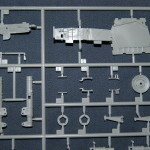 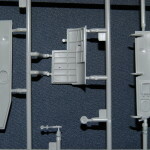 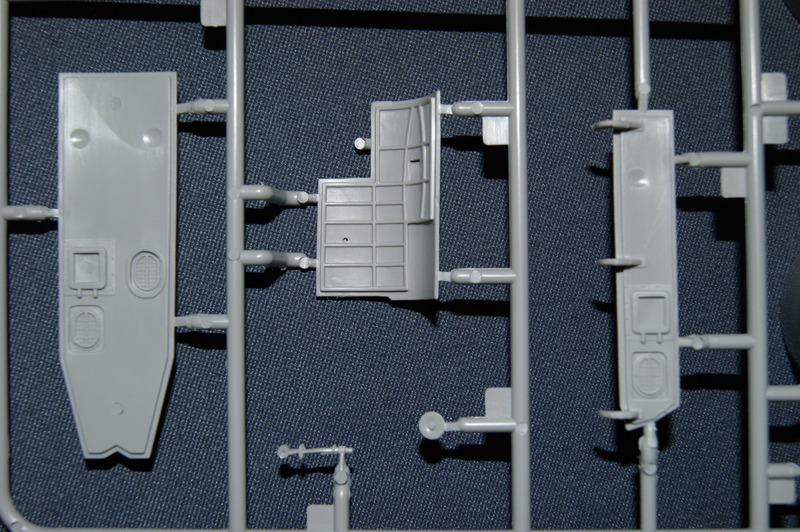 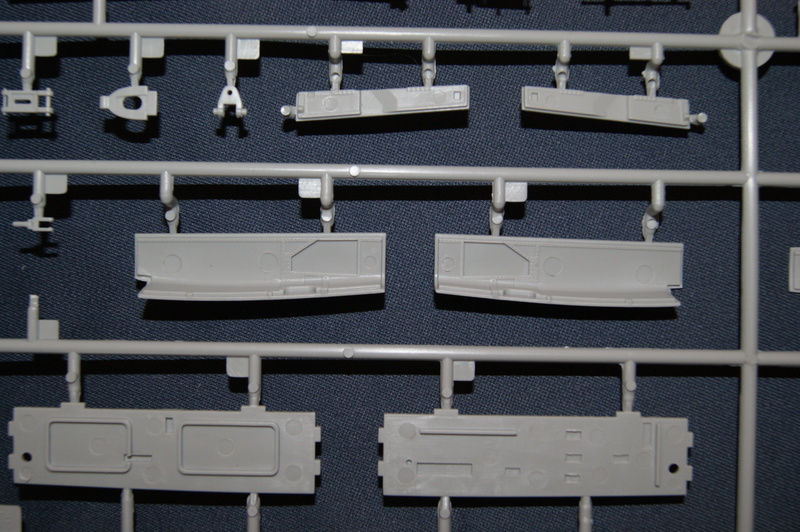 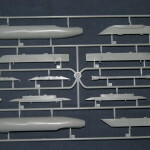 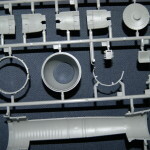 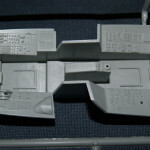 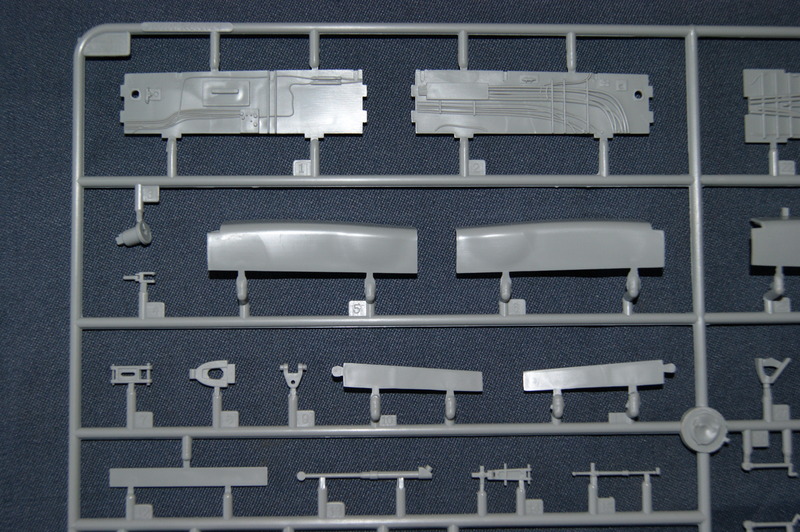 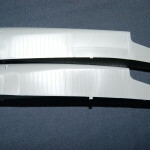 Sprue S: A smaller sprue which holds the door for the front wheelbay, one for the open option (the other is on Sprue H) and the other for the closed option. 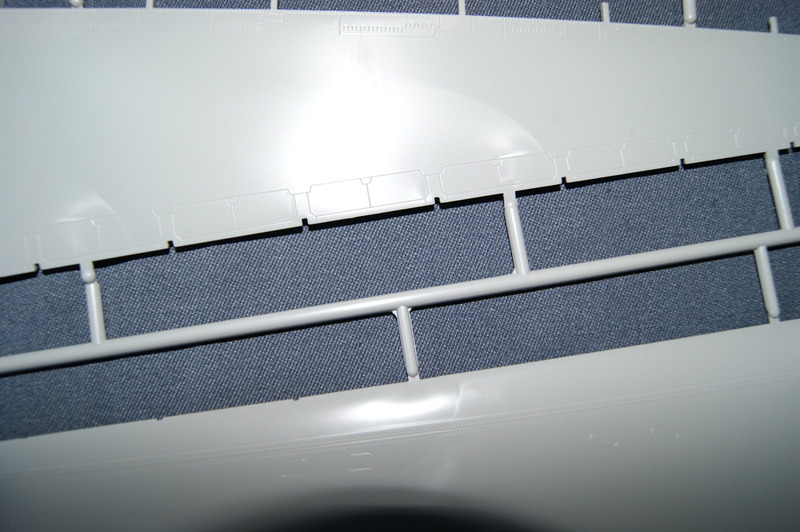 Some parts for the rear end of the aircraft are present here as well. 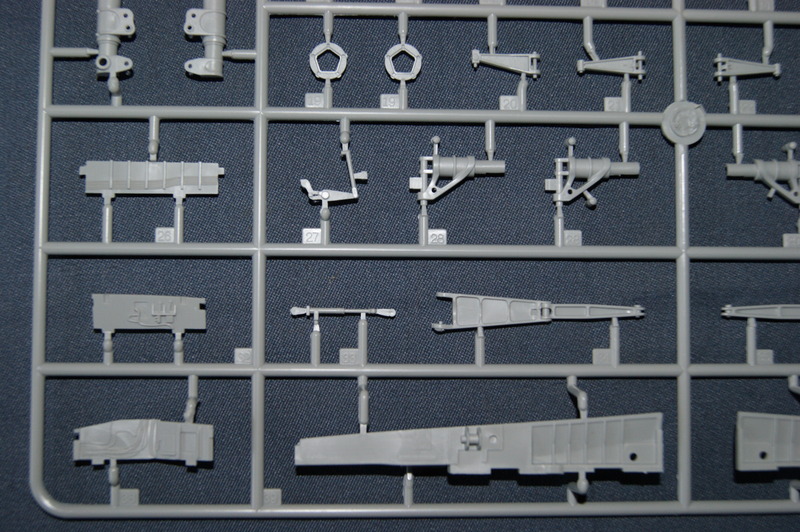 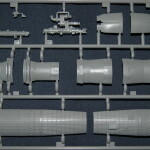 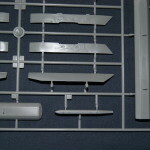 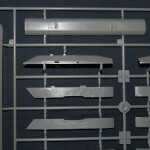 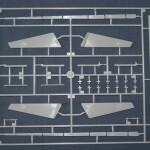 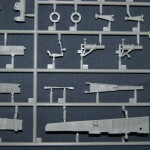 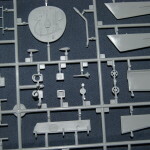 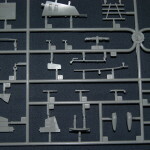 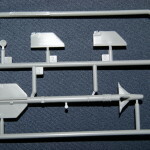 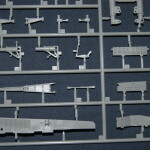 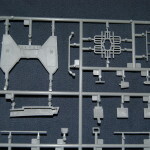 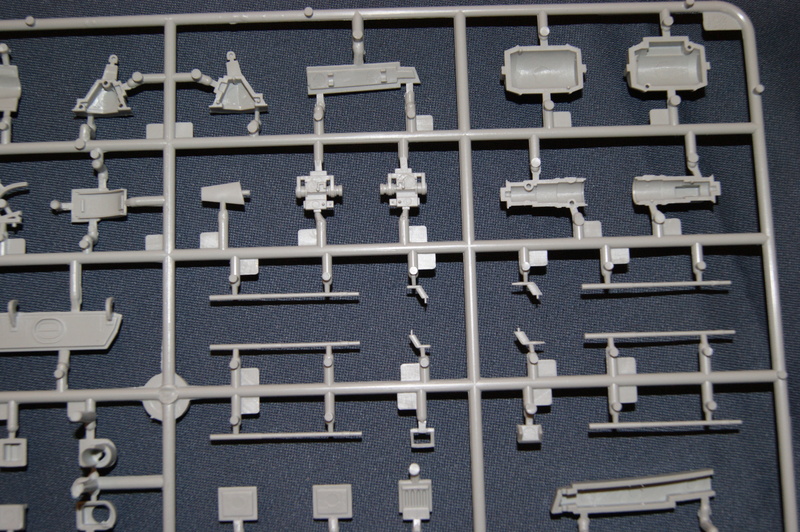 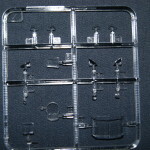 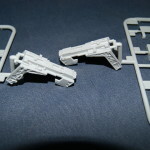 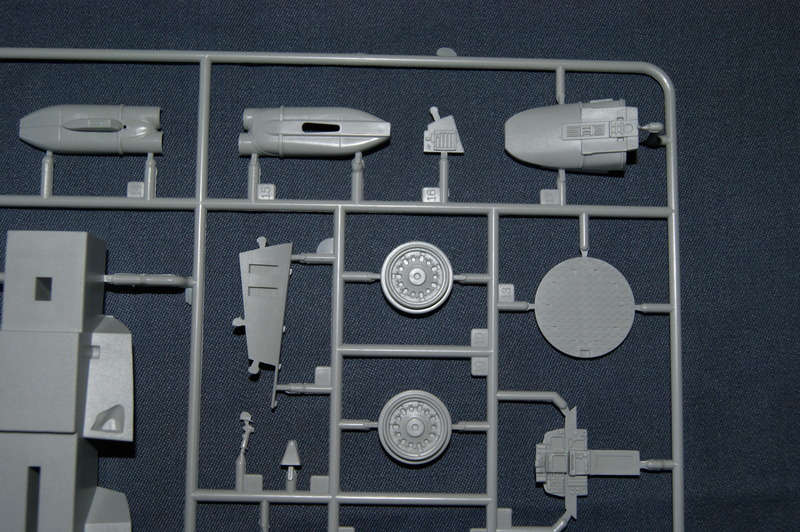 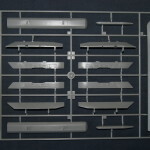 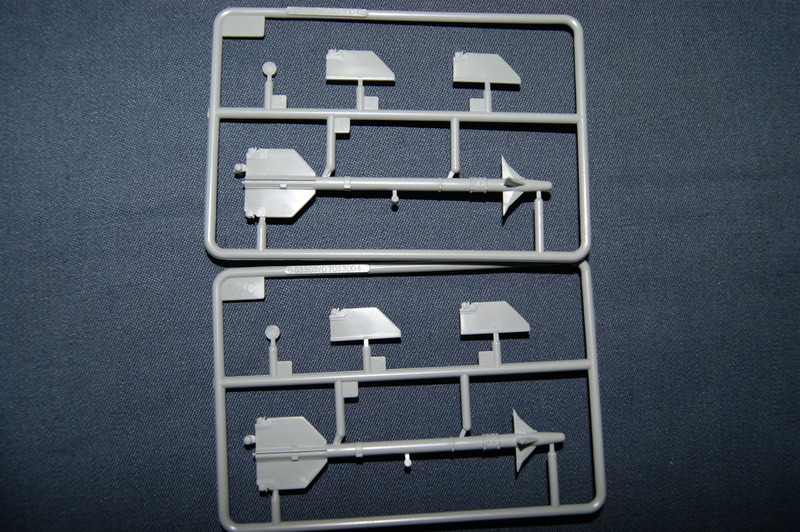 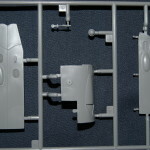 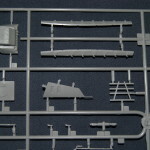 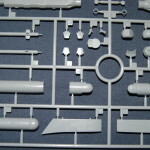 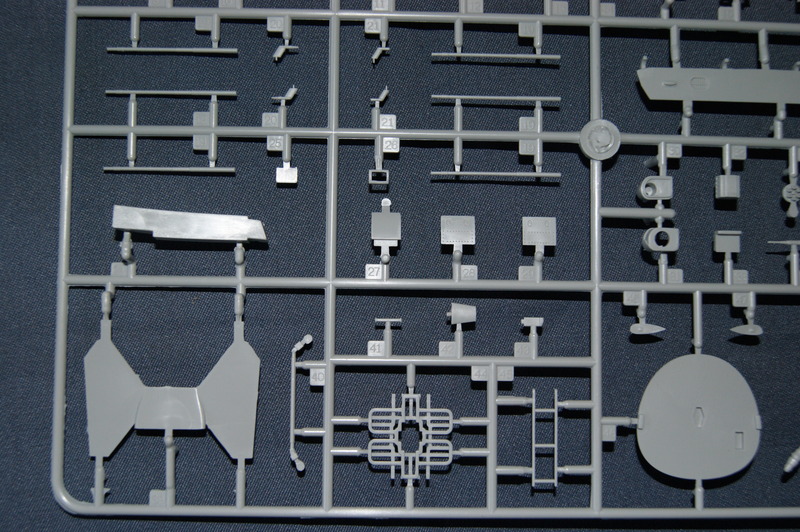 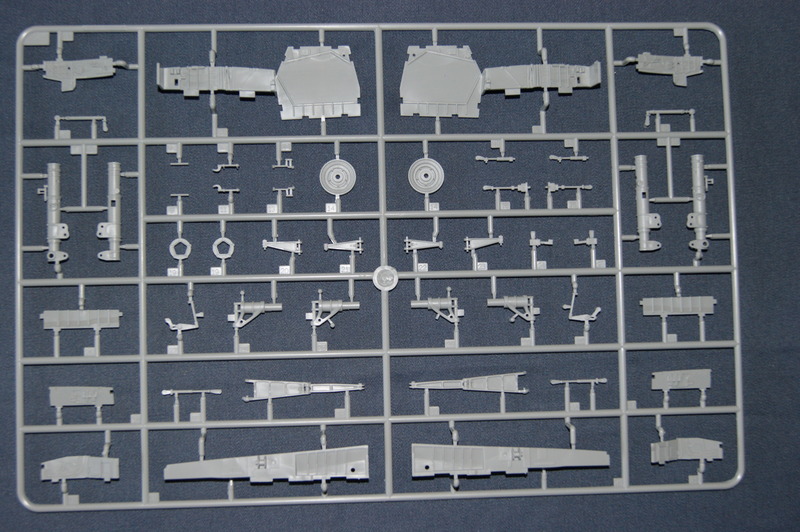 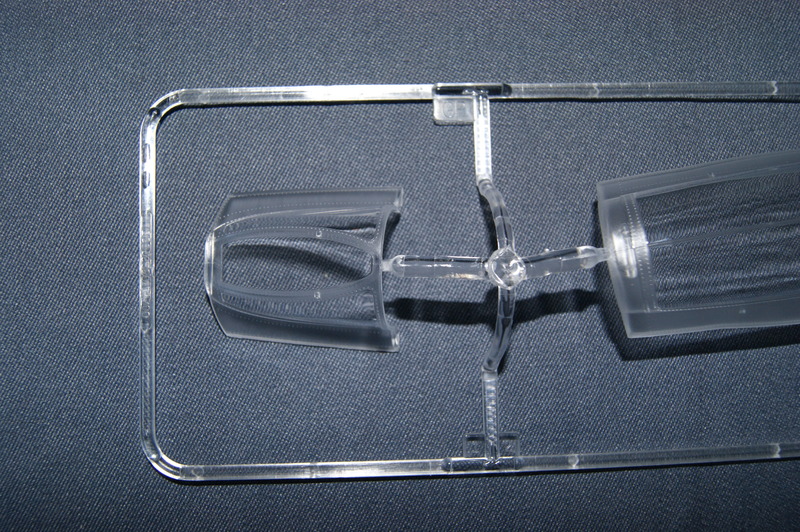 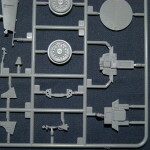 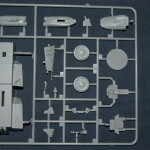 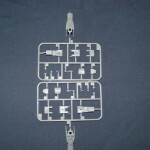 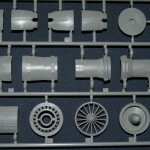 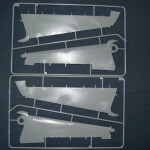 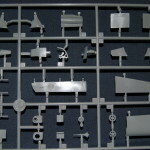 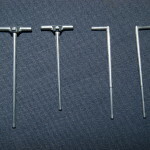 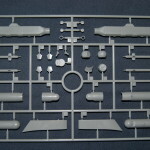 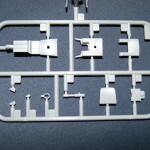 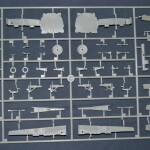 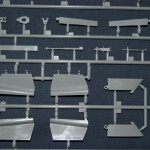 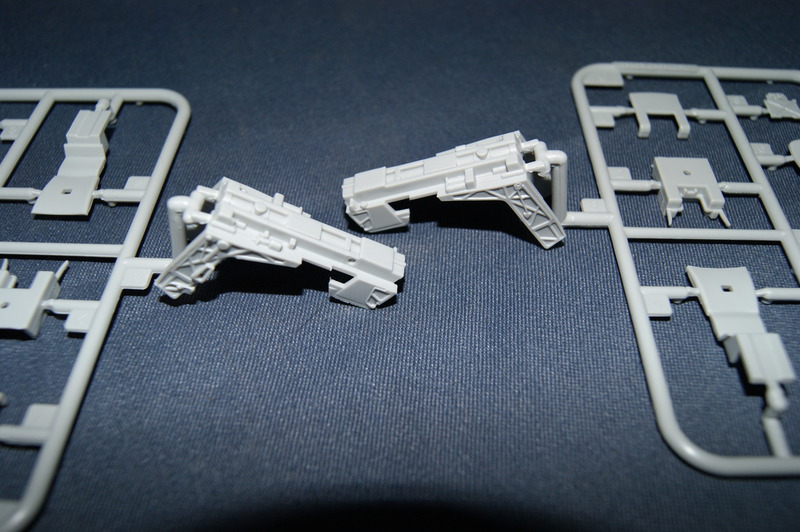 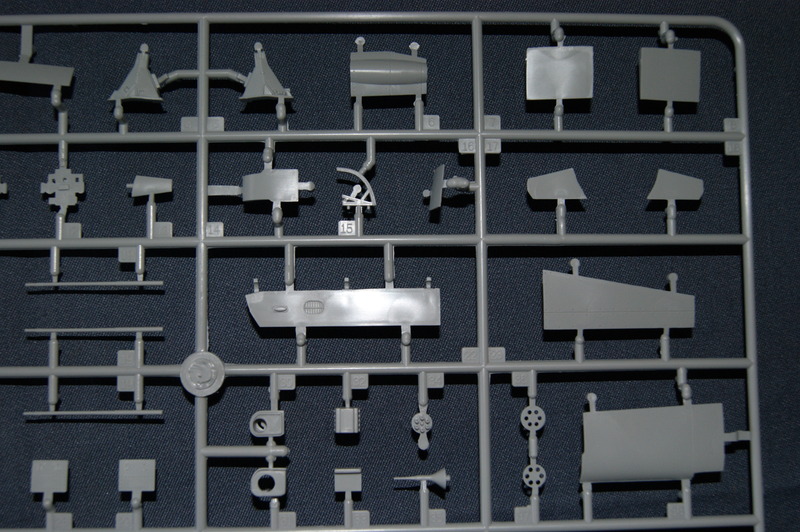 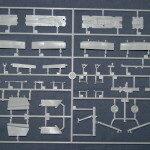 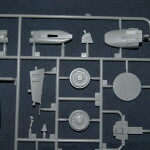 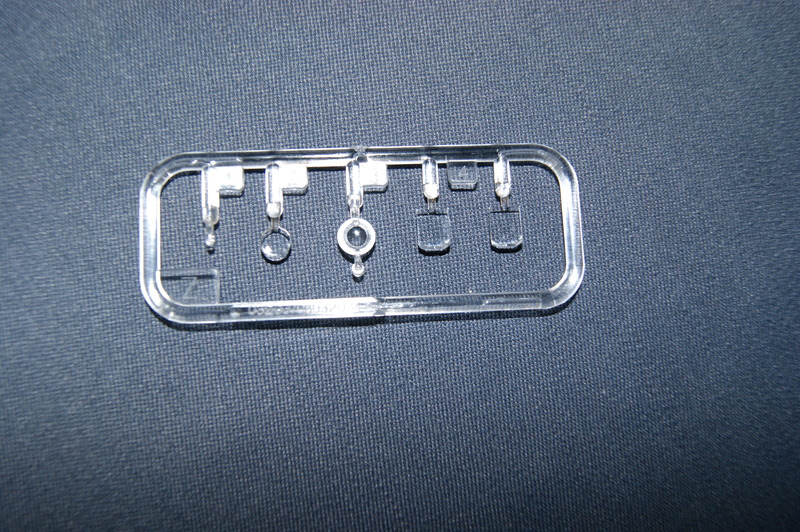 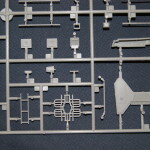 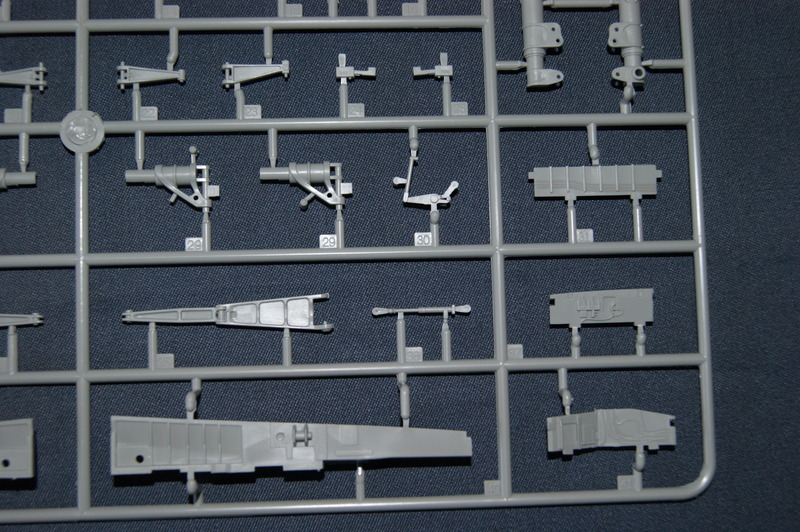 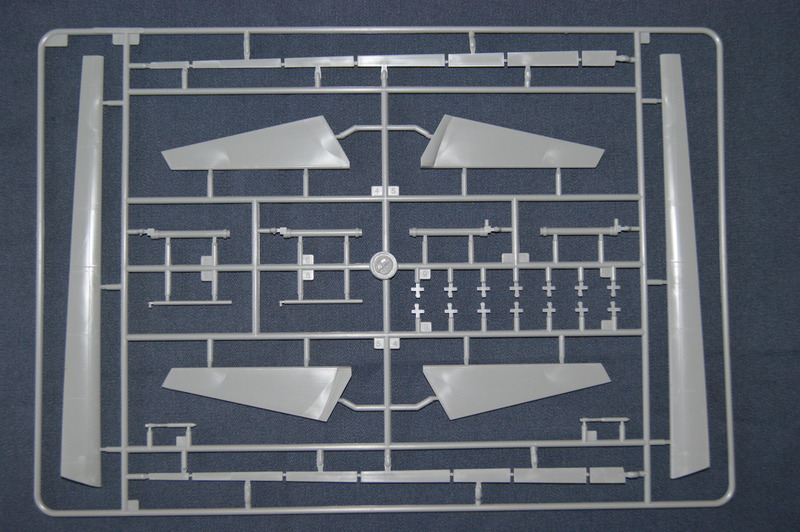 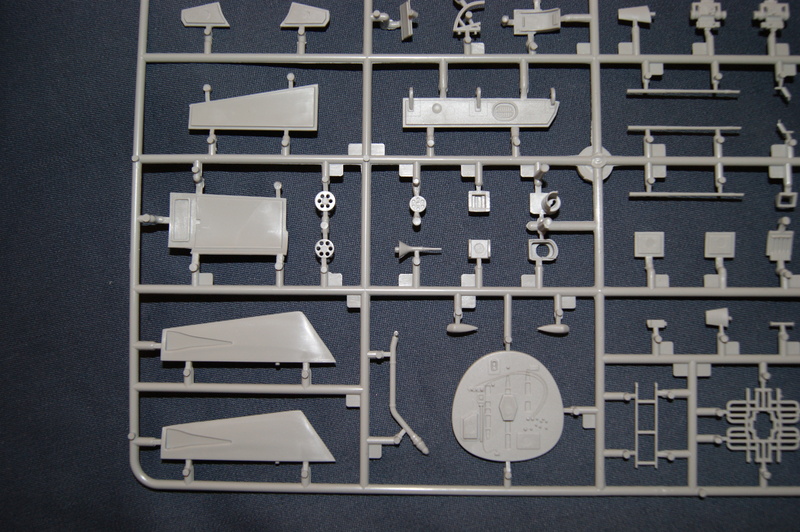 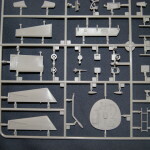 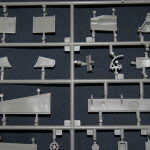 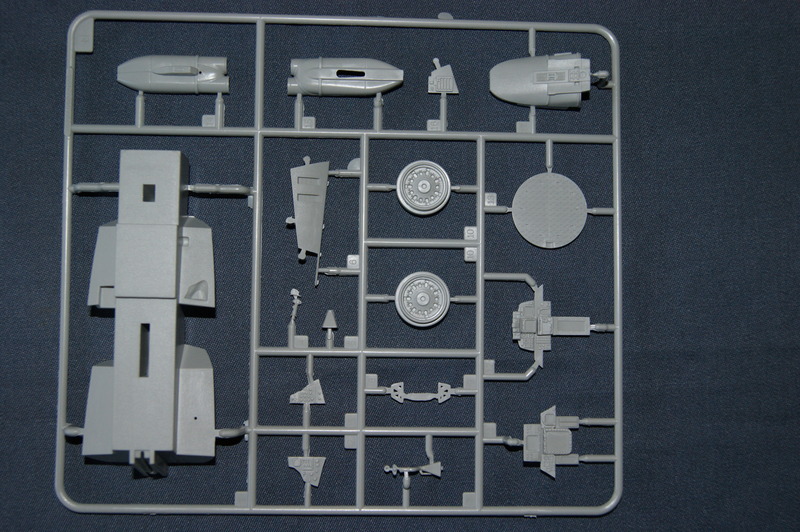 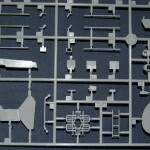 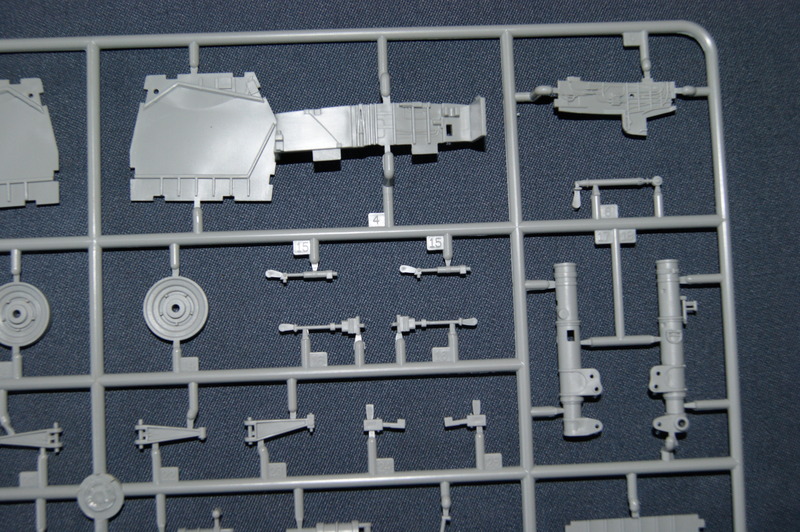 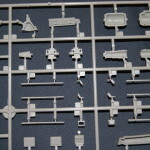 Sprue U (2X): These small sprues come in a box and contain ejector seat parts. 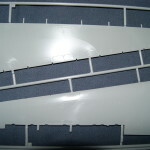 Perhaps some resin seats can look a bit nicer but out of the box with addition of some seatbelts these can look really nice too. 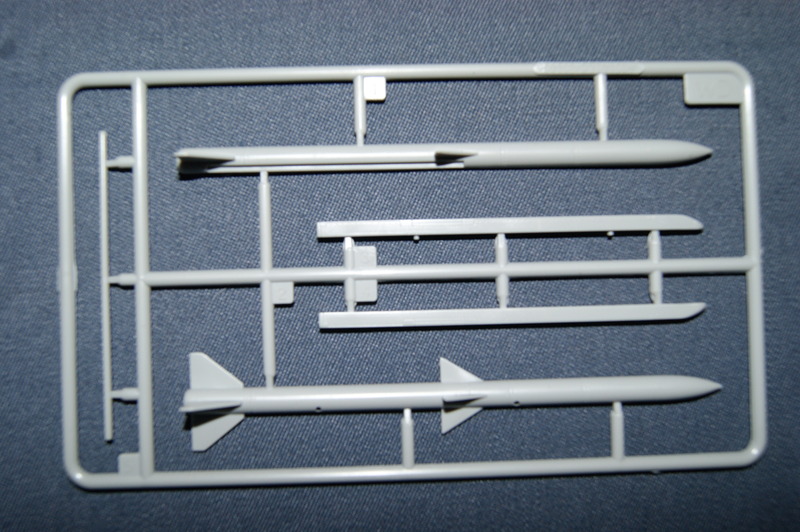 Sprue V: A nice sprue with pylons and the launch rails for the Aim-54’s. 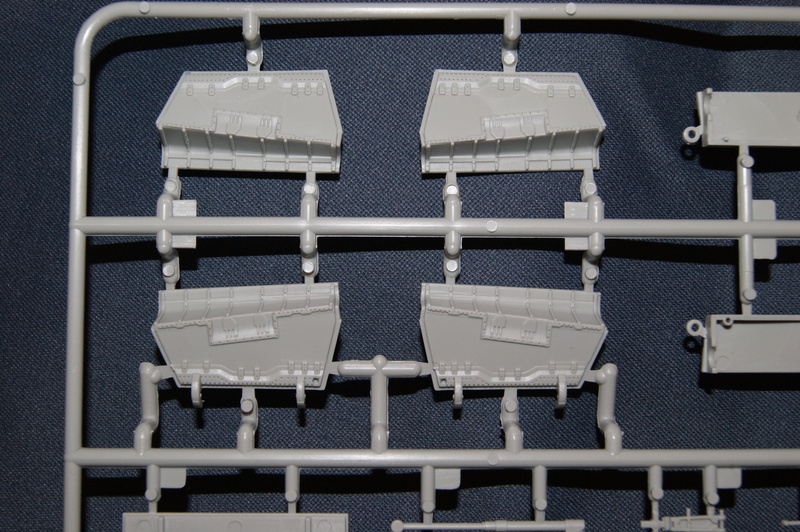 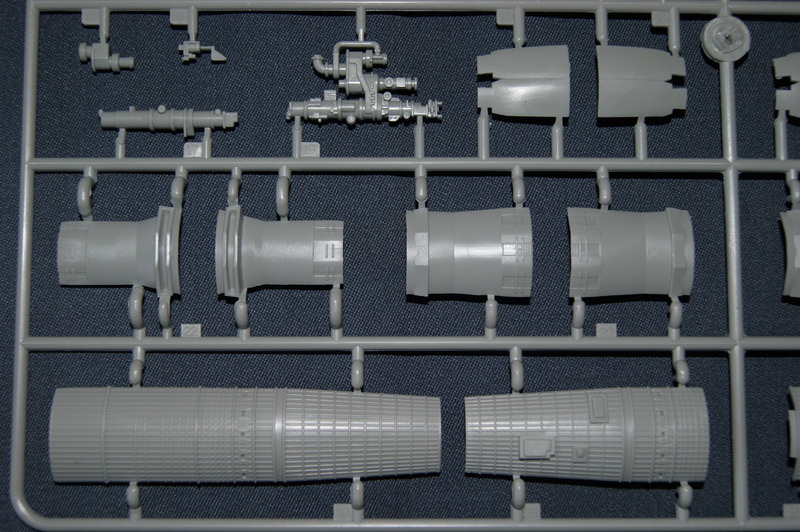 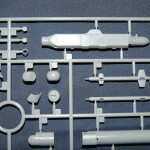 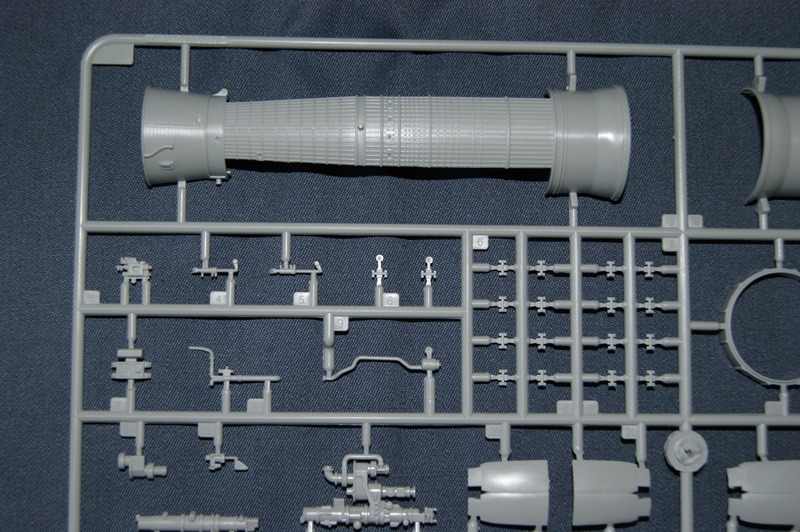 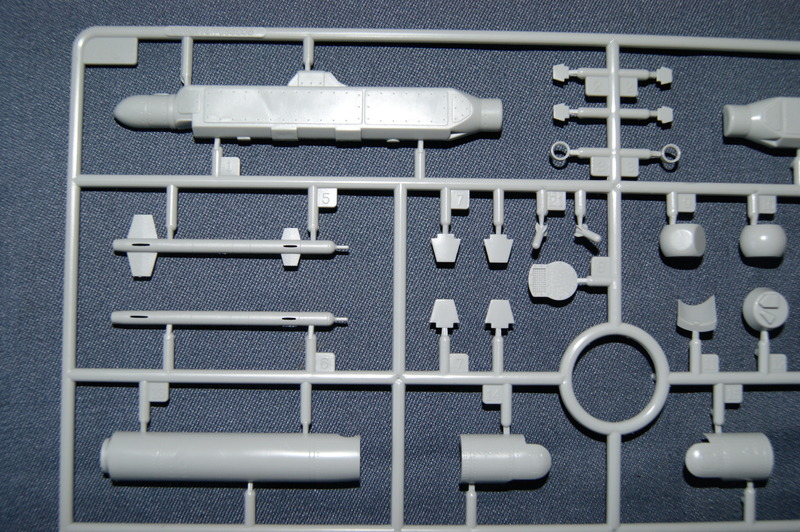 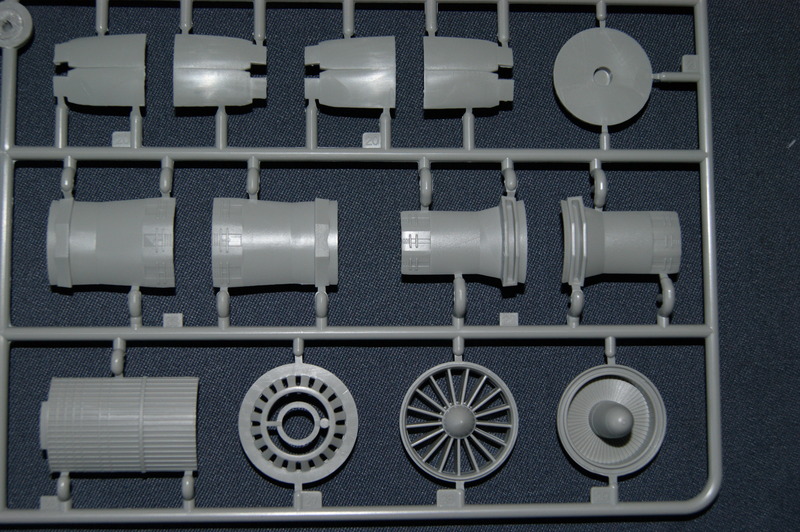 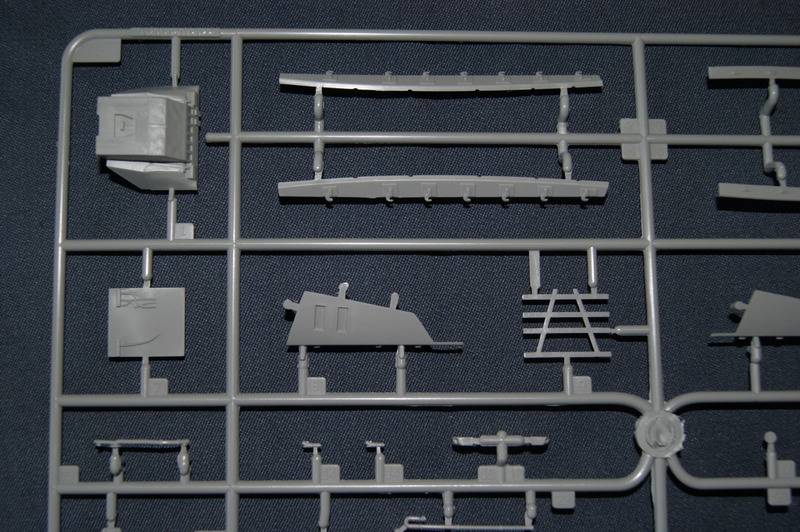 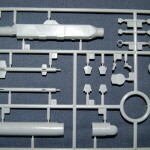 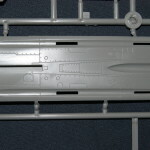 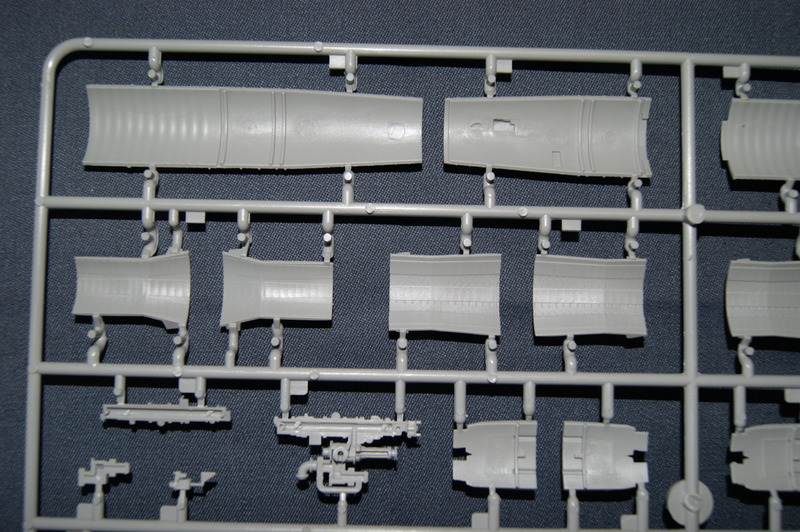 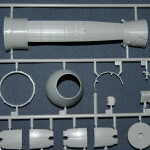 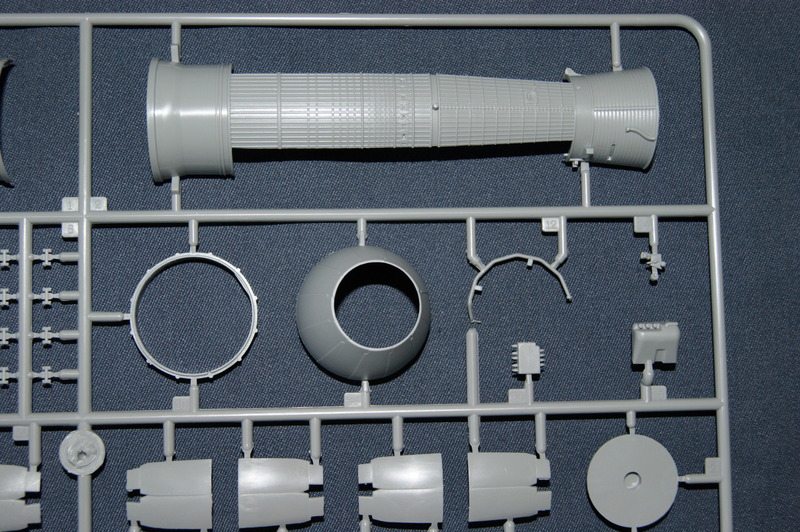 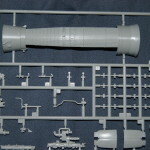 Sprue W (2x): More pylons and the external fuel tanks. 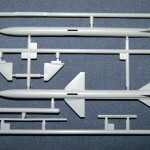 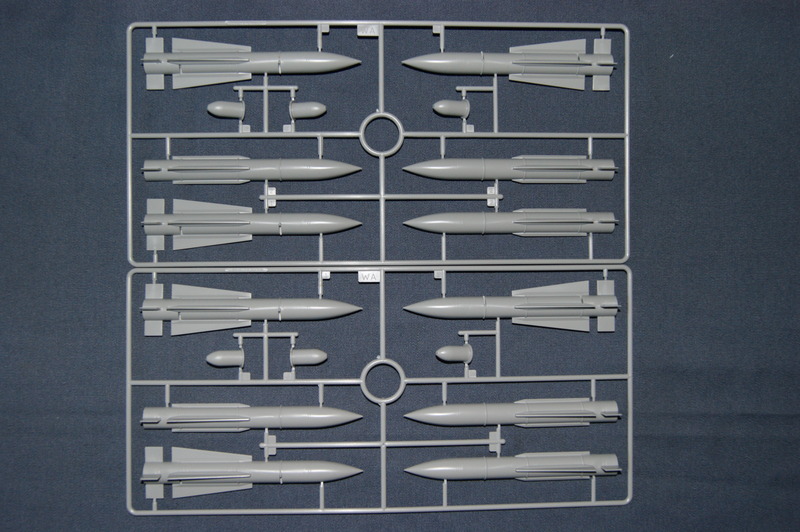 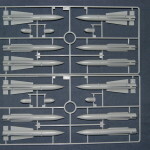 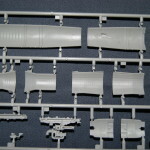 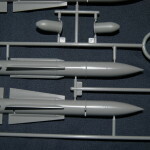 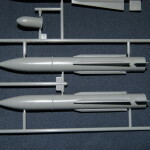 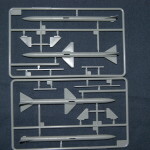 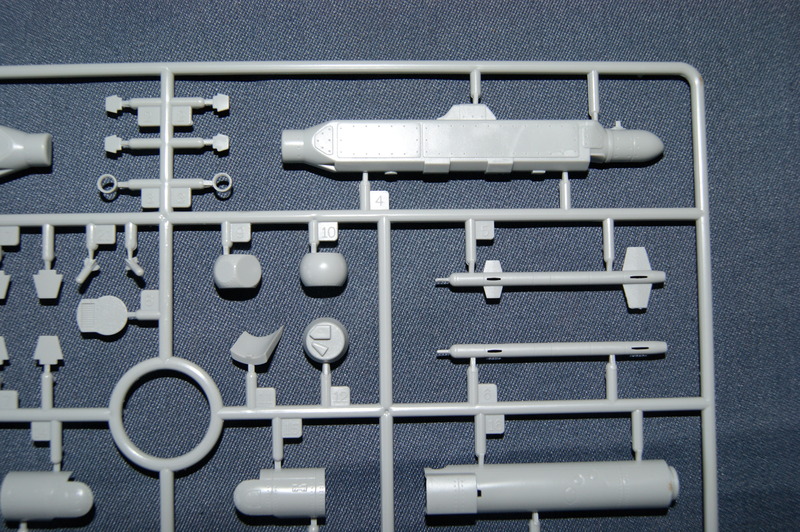 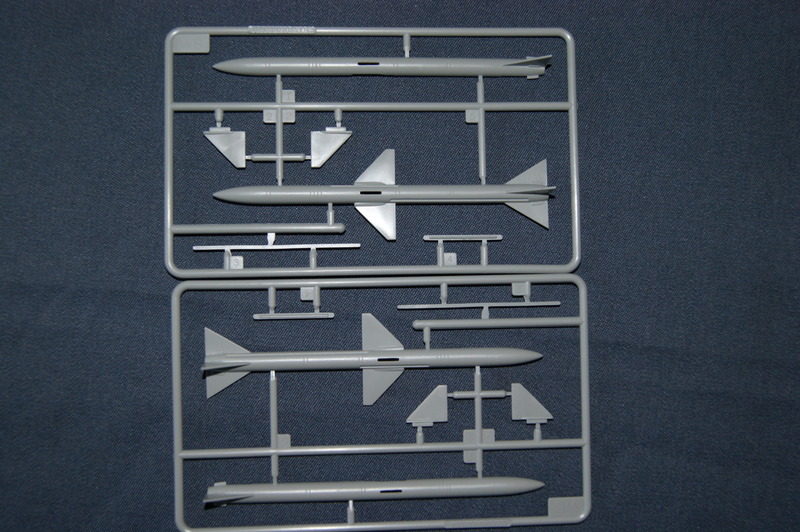 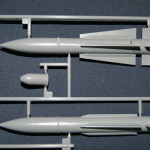 Sprue WA (2x): The Aim-54’s of which you get six. 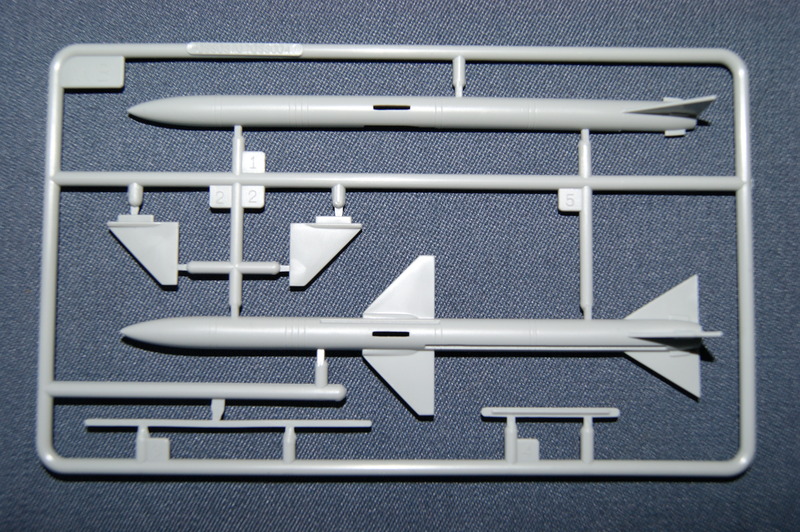 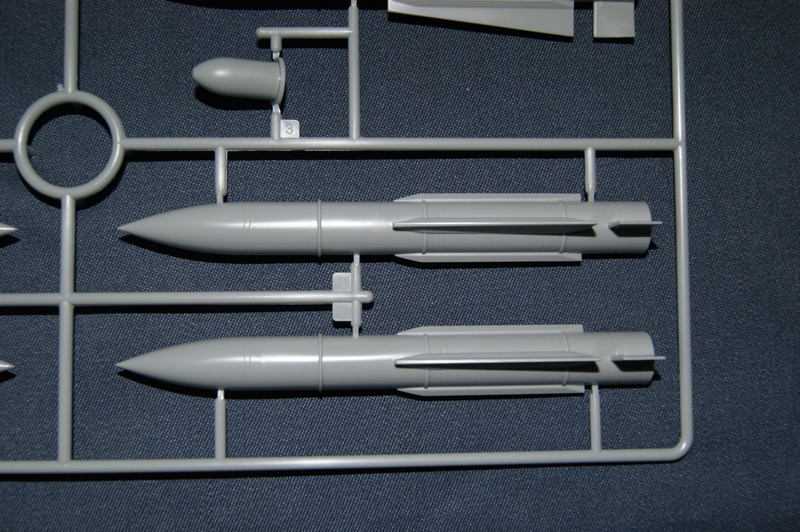 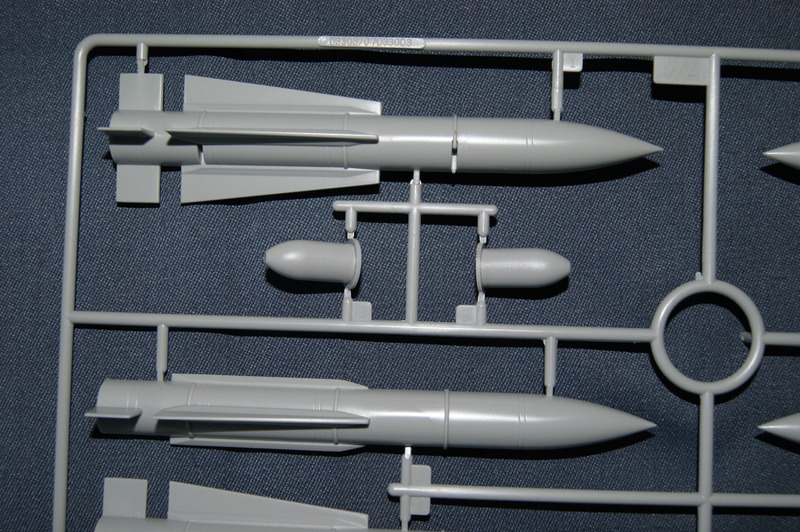 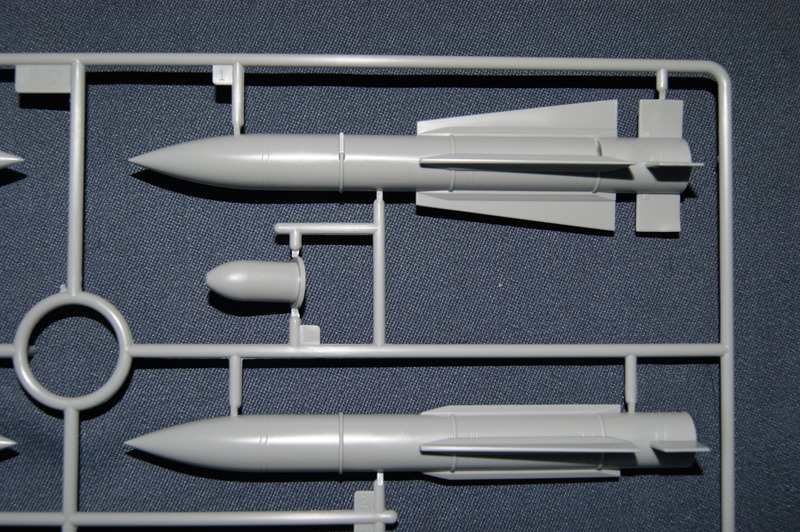 Sprue WB (2x): The Aim-7’s of which you get two. 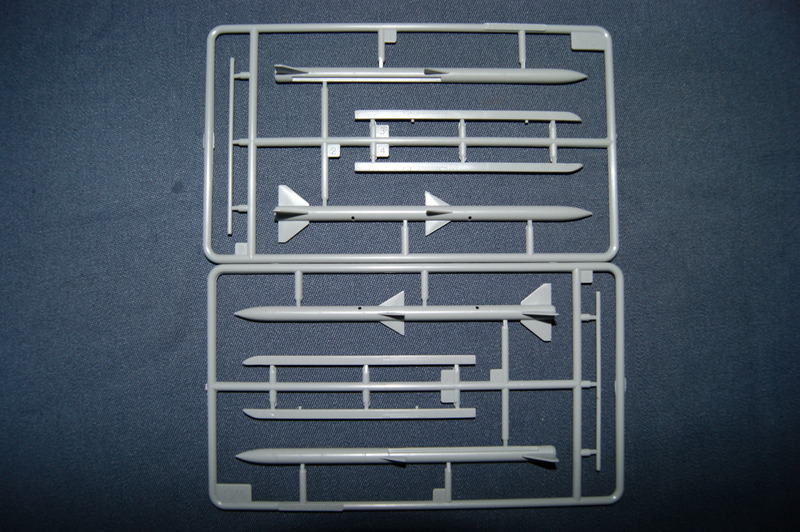 Sprue WC (2x): The Aim-9’s of which you get two. 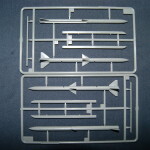 Sprue WD (2x): The Aim-120’s of which you get two. 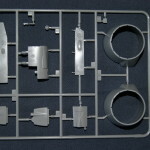 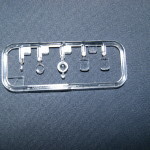 Sprue WJ: This sprue holds the AN/AAQ-25, two LGTR’s and a AN/ALQ 131 which isn’t used for this kit, so that can go in your sparebox. 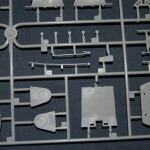 Sprue X: A clear sprue which looks nice and clean. 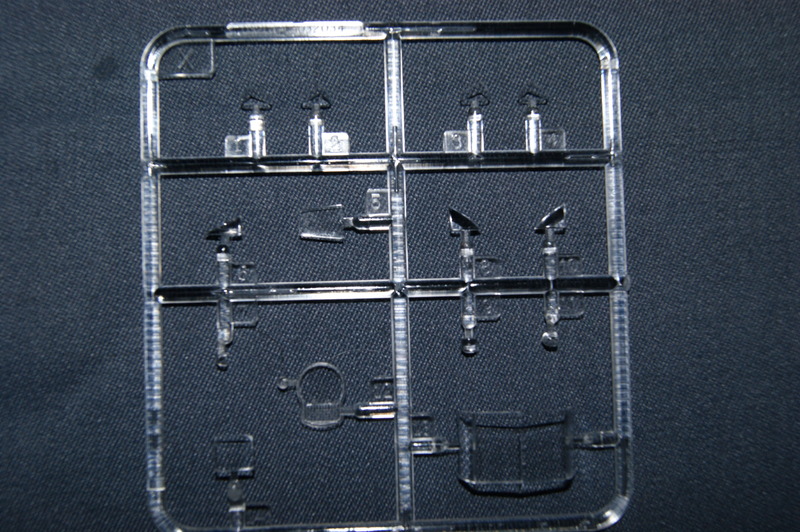 Sprue Z: A very small sprue with some clear parts which like look nice as well! 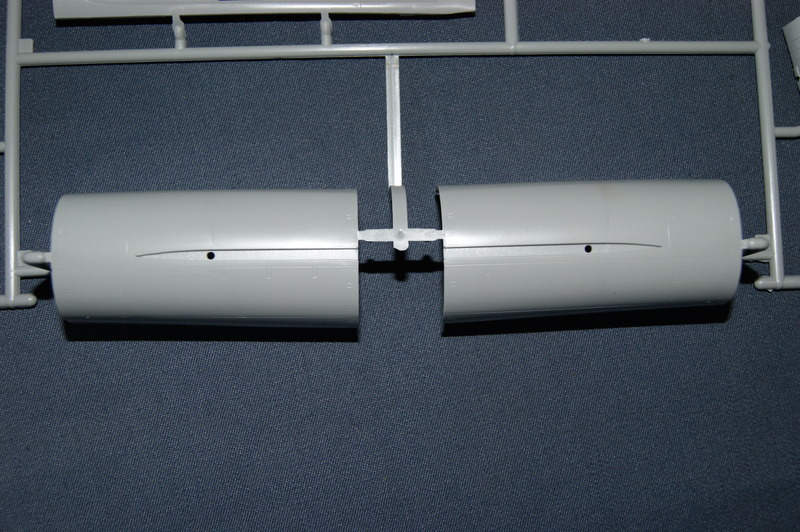 Air intakes: two separately packed air intakes who look good but probably need a bit of force to keep in the right position when glued. 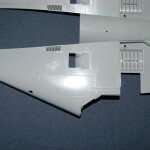 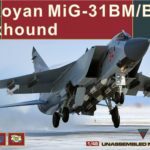 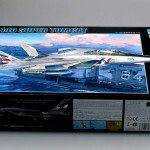 These will give the model that characteristic look of the F-14. 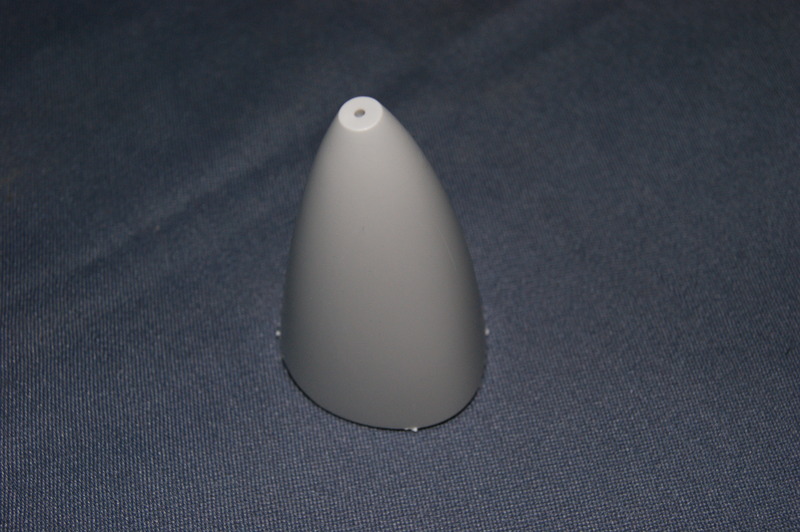 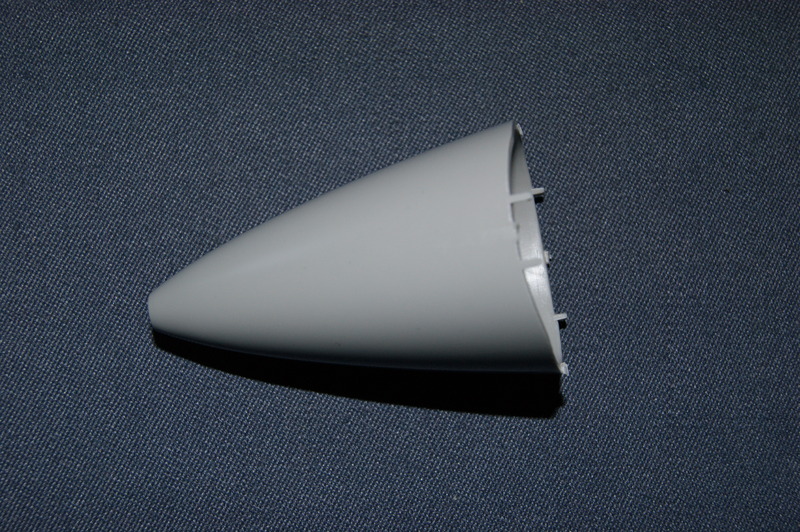 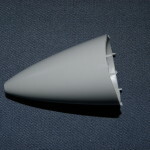 Nose cone: A nice one piece nose cone. 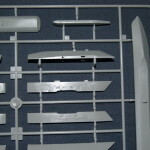 Photo etch: A small fret with parts for the seatbelts and the rear view mirrors. 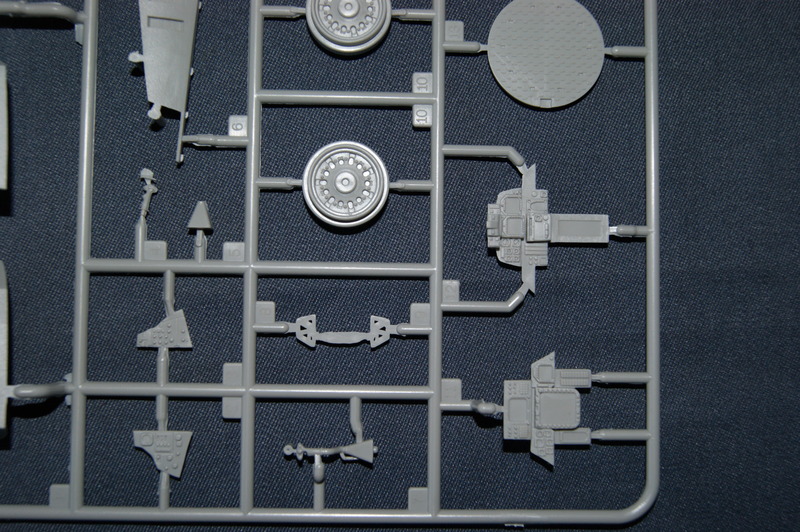 Landing gear core: You get four metal parts for the landing gear cores to support the weight of the heavy model where plastic landing gears probably would break or bend. 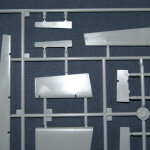 You build the plastic parts around it. 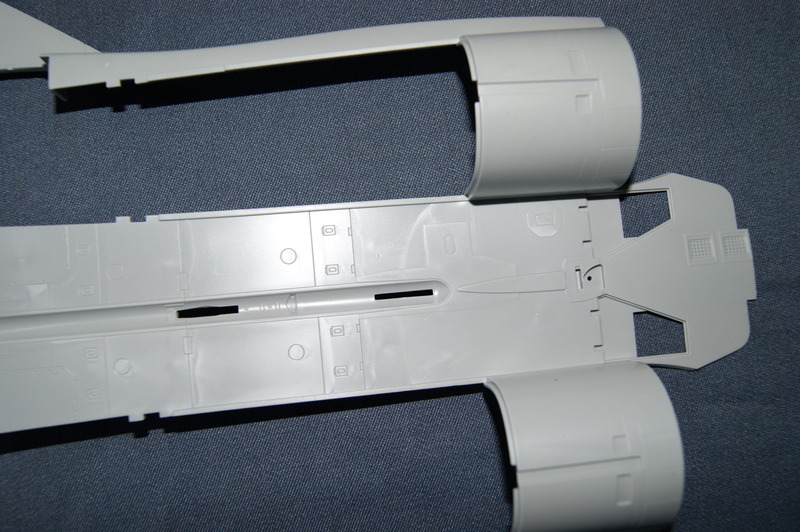 Also a nice option for the front landing gear, you get a short version and a longer version so you can do it in a catapult setting for instance. 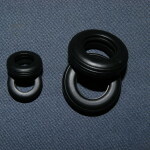 Rubber wheels: Four rubber wheels for the landing gear. 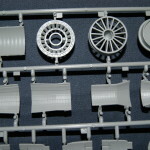 They look nice but I wouldn’t have minded some sagged wheels either. 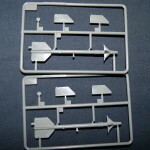 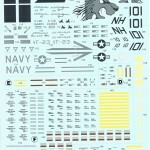 Decal sheets: These two large decal sheets actually look a bit better than I’ve hoped for since the older Trumpeter decals always felt a bit thick to me. 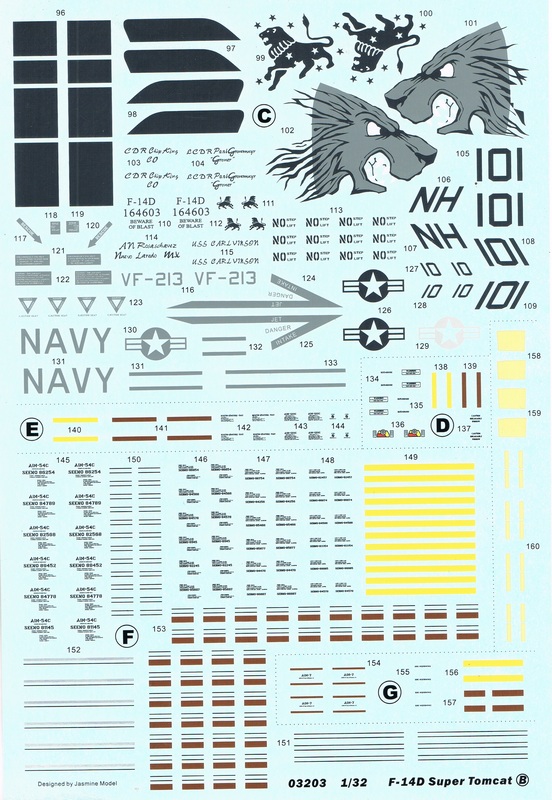 Other than that there are 3 cool markings provided all three with a different kind of look to the model through colors etcetera so that is nice. 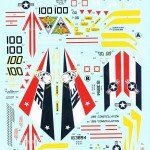 This Kit is mega, that’s for sure. 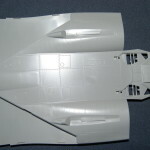 The detailing is great, options are available and cool as are the decal options. 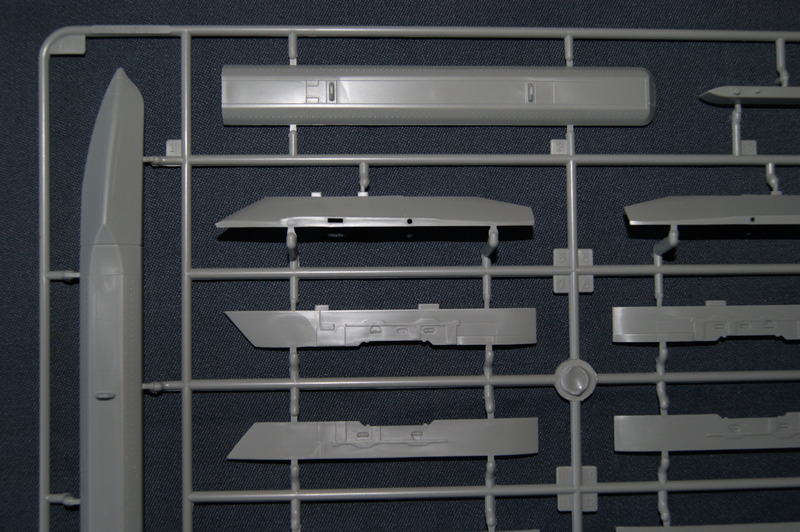 You won’t need a lot of aftermarket for this kit because the level of detail on the parts that are mostly replaced by aftermarket stuff do look really nice out of the box. 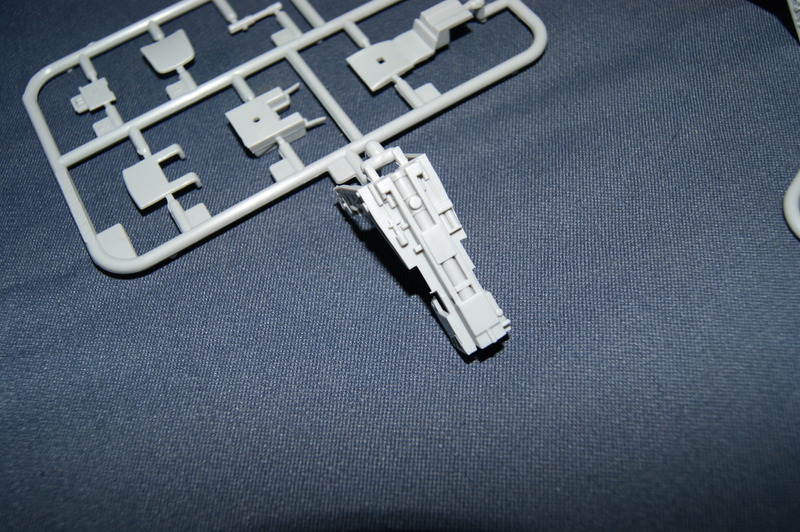 The biggest downside to me are the sinkmarks on some visible parts. 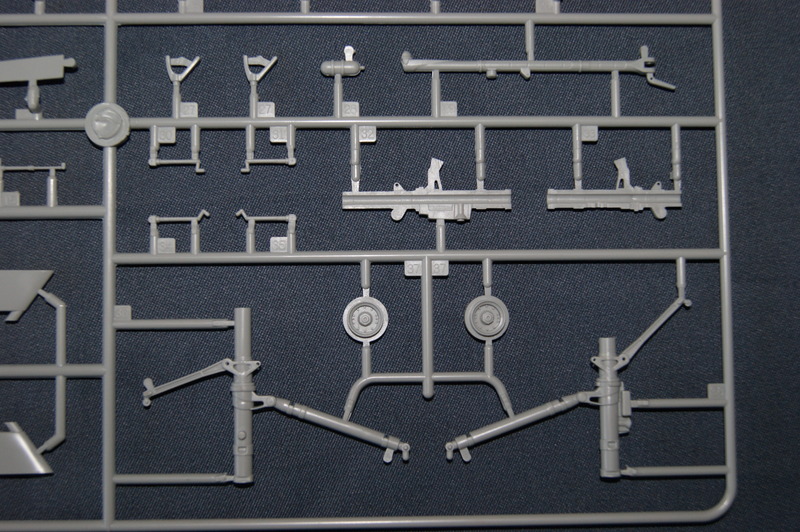 The lack of explanation in the instructions shouldn’t form a real big problem to the more experienced builders but I still think that this could be a lot better. 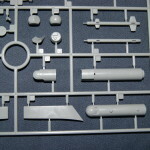 Other than those small things I haven’t found any real big things that could stand in the way of making a fantastic model!